For a chronological guide to this subject, see Timeline of the presidency of Franklin D. Roosevelt. The presidency of Franklin D. Roosevelt began on March 4, 1933, when he was inaugurated as the 32nd President of the United States, and ended upon his death on April 12, 1945, a span of 12 years, 39 days (4,422 days). [a] Roosevelt assumed the presidency in the midst of the Great Depression. Starting with his landslide victory over Republican President Herbert Hoover in the 1932 election, he would go on to win a record four presidential terms, and became a central figure in world affairs during World War II. His program for relief, recovery and reform, known as the New Deal, involved a great expansion of the role of the federal government in the economy. Under his steady leadership, the Democratic Party built a "New Deal Coalition" of labor unions, big city machines, white ethnics, African Americans, and rural white Southerners, that would significantly realign American politics for the next several decades in the Fifth Party System and also define modern American liberalism. During his first hundred days in office, Roosevelt spearheaded unprecedented major legislation and issued a profusion of executive orders that instituted the New Deal—a variety of programs designed to produce relief (government jobs for the unemployed), recovery (economic growth), and reform (through regulation of Wall Street, banks and transportation). After his party's success in the 1934 mid-term elections, Roosevelt passed another package of domestic legislation that created Social Security, a national unemployment insurance program, and the National Labor Relations Board. After winning re-election, Roosevelt sought to enlarge the Supreme Court, but his proposal was defeated in Congress. Roosevelt experienced less success in passing domestic legislation in his second term, as the bipartisan Conservative Coalition blocked most of his legislative proposals, aside from the Fair Labor Standards Act. When the war began and unemployment largely became a non-issue, Congress repealed the major relief programs, but many other New Deal programs and agencies remained intact. The international situation declined in the 1930s as Japan, Italy, and Nazi Germany all made aggressive moves towards other countries. Though many in the United States were strongly isolationist, Roosevelt gave diplomatic and financial support to China, the United Kingdom, France, and the Soviet Union via initiatives such as the Lend-Lease program. The United States entered the war after Japan attacked the U.S. naval base at Pearl Harbor. Assisted by his top aide Harry Hopkins, and with very strong national support, Roosevelt worked closely with British Prime Minister Winston Churchill, Soviet leader Joseph Stalin, and Chinese Generalissimo Chiang Kai-shek in leading the Allies during World War II. Roosevelt supervised the mobilization of the U.S. economy to support the war effort, and the war saw the end of the massive unemployment that characterized the Great Depression. Roosevelt implemented a war strategy on two fronts that ended in the defeat of the Axis Powers and the development of the world's first nuclear bomb. 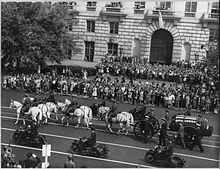 Roosevelt's health seriously declined during the war years, and he died in April 1945. Though he died months before the end of the war, his work on the post-war order shaped the new United Nations and the Bretton Woods international financial system. Roosevelt was succeeded by Vice President Harry S. Truman, who presided over the end of the war in September 1945. It was on Roosevelt's watch that the Democratic Party was returned to dominance, prosperity returned, and two great military enemies were destroyed. Scholars, historians and the public typically rank Roosevelt alongside Abraham Lincoln and George Washington as one of the three greatest U.S. presidents. With the economy ailing after the Wall Street Crash of 1929, many Democrats hoped that the party would win its first presidential election since Woodrow Wilson's victory in 1916. Roosevelt's 1930 gubernatorial re-election victory in New York established him as the front-runner for the 1932 Democratic presidential nomination. With the help of allies such as Louis Howe, James Farley, and Edward M. House, Roosevelt rallied the progressive supporters of Wilson while also appealing to many conservatives, establishing himself as the leading candidate in the South and West. Roosevelt entered the convention with a delegate lead due to his success in the 1932 Democratic primaries, but most delegates entered the convention unbound to any particular candidate. The chief opposition to Roosevelt's candidacy came from Northeastern conservatives such as Al Smith, the 1928 Democratic presidential nominee. Smith hoped to deny Roosevelt the two-thirds support necessary to win the party's presidential nomination at the 1932 Democratic National Convention, and then emerge as the nominee after multiple rounds of balloting. On the first presidential ballot of the convention, Roosevelt received the votes of more than half but less than two-thirds of the delegates, with Smith finishing in a distant second place. Speaker of the House John Nance Garner, who controlled the votes of Texas and California, threw his support behind Roosevelt after the third ballot, and Roosevelt clinched the nomination on the fourth ballot. With little input from Roosevelt, Garner won the party's vice presidential nomination. Roosevelt flew in from New York after learning that he had won the nomination, becoming the first major party presidential nominee to accept the nomination in person. In the general election, Roosevelt faced incumbent Republican President Herbert Hoover. Engaging in a cross-country campaign, Roosevelt promised to increase the federal government's role in the economy and to lower the tariff as part of a "New Deal." Hoover argued that the economic collapse had chiefly been the product of international disturbances, and he accused Roosevelt of promoting class conflict with his novel economic policies. Already unpopular due to the bad economy, Hoover's re-election hopes were further hampered by the Bonus March 1932, which ended with the violent dispersal of thousands of protesting veterans. Roosevelt won 472 of the 531 electoral votes and 57.4% of the popular vote, making him the first Democratic presidential nominee since the Civil War to win a majority of the popular vote. In the concurrent congressional elections, the Democrats took control of the Senate and built upon their majority in the House of Representatives. Though congressional Democratic leadership was dominated by conservative Southerners, over half of the members of the incoming 73rd Congress had been elected since 1930. Many of these new members were eager to take action to combat the Depression, even if it meant defying the political orthodoxy of the previous years. For his first Secretary of State, Roosevelt selected Cordell Hull, a prominent Tennessean who had served in the House and Senate. Though Hull had not distinguished himself as a foreign policy expert, he was a long-time advocate of tariff reduction, was respected by his Senate colleagues, and did not hold ambitions for the presidency. Roosevelt's inaugural cabinet included several influential Republicans, including Secretary of the Treasury William H. Woodin, a well-connected industrialist who was personally close to Roosevelt, Secretary of the Interior Harold L. Ickes, a progressive Republican who would play an important role in the New Deal, and Secretary of Agriculture Henry A. Wallace, who had advised the Roosevelt campaign on farm policies. Roosevelt also appointed the first female cabinet member, Secretary of Labor Frances C. Perkins. Farley became Postmaster General, while Howe became Roosevelt's personal secretary until his death in 1936. The selections of Hull, Woodin, and Secretary of Commerce Daniel C. Roper reassured the business community, while Wallace, Perkins, and Ickes appealed to Roosevelt's left-wing supporters. Most of Roosevelt's cabinet selections would remain in place until 1936, but ill health forced Woodin to resign in 1934, and he was succeeded by Henry Morgenthau Jr.
As World War II approached, Roosevelt appointed new individuals to key positions. Frank Knox, the 1936 Republican vice presidential nominee, became Secretary of the Navy while former Secretary of State Henry L. Stimson became Secretary of War. Roosevelt began convening a "war cabinet" consisting of Hull, Stimson, Knox, Chief of Naval Operations Harold Rainsford Stark, and Army Chief of Staff George Marshall. In 1942, Roosevelt set up the Joint Chiefs of Staff, which made the final decisions on American military strategy. Admiral Ernest J. King (Stark's successor) led the navy and the marines. Marshall was in charge of the army and nominally led the air force, which in practice was commanded by General Hap Arnold. The Joint Chiefs was a White House agency, and was chaired by Roosevelt's old friend, Admiral William D. Leahy. When dealing with Europe, the Joint Chiefs met with their British counterparts and formed the Combined Chiefs of Staff. Unlike the political leaders of the other major powers, Roosevelt rarely overrode his military advisors. [page needed] His civilian appointees handled the draft and procurement of men and equipment, but no civilians – not even the secretaries of War or Navy, had a voice in strategy. Roosevelt avoided the State Department and conducted high level diplomacy through his aides, especially Harry Hopkins. Since Hopkins also controlled $40 billion in Lend-Lease funds given to the Allies, they paid attention to him. After four years of increasingly bitter battles between the White House and the Supreme Court, Roosevelt finally had his opportunity to appoint his own people starting in 1937. [page needed] The first Supreme Court vacancy of Roosevelt's tenure arose due to the retirement of Associate Justice Willis Van Devanter. Roosevelt's first Supreme Court appointment went to Senator Hugo Black of Alabama, who had shared Roosevelt's frustration with the Supreme Court. George Sutherland's retirement in 1938 created a second vacancy, and Roosevelt successfully nominated Solicitor General Stanley Forman Reed to succeed Sutherland. Upon the death of Benjamin N. Cardozo in 1938, Roosevelt nominated Felix Frankfurter to the Supreme Court. Frankfurter had long had the ear of the president, especially in regards to finding talented young appointees, so his own appointment to the court was not a surprise. To replace retiring Associate Justice Louis Brandeis, Roosevelt appointed William O. Douglas, the 39-year-old Chairman of the Securities and Exchange Commission. In 1940, Roosevelt replaced the retiring Pierce Butler with Attorney General Frank Murphy, who had previously served as the Governor of Michigan. Due to the retirements of Chief Justice Charles Evans Hughes and Associate Justice James Clark McReynolds, Roosevelt filled three Supreme Court vacancies in 1941. He elevated Stone to chief justice and appointed Senator James F. Byrnes of South Carolina and Attorney General Robert H. Jackson as associate justices. The combination of the liberal Jackson, centrist Stone, and conservative Byrnes helped ensure the Senate confirmation of all three justices. Byrnes disliked serving on the Court, and he resigned to take a position in the Roosevelt administration in 1942. He was replaced by Wiley Blount Rutledge, a liberal federal appellate judge who would serve on the Supreme Court for just seven years. By 1941, eight of the nine justices were Roosevelt appointees. Of the justices on the court when Roosevelt took office, only Stone and Owen Roberts and would outlast Roosevelt. Roosevelt's appointees upheld his policies, but often disagreed in other areas, especially after Roosevelt's death. Douglas and Black served until the 1970s and joined or wrote many of the major decisions of the Warren Court, while Jackson and Frankfurter advocated judicial restraint and deference to elected officials. Roosevelt also made 51 appointments to the United States courts of appeals and 134 appointments to the United States district courts. He made more appointments to either court than any of his predecessors. Historians categorize Roosevelt's major initiatives into relief, recovery and reform. Relief was urgently needed by tens of millions of unemployed. Recovery meant boosting the economy back to normal (but did not include plans for future growth). Reform meant long-term fixes of what was dysfunctional with labor relations, finance and banking. Through Roosevelt's series of radio talks, known as fireside chats, he built strong public support. To propose programs, Roosevelt relied on leading senators such as George Norris, Robert F. Wagner, and Hugo Black, as well as his Brain Trust of academic advisers. Roosevelt was most successful in his first term. After winning a smashing reelection in 1936, the conservative opposition mobilized and blocked most of his new ideas. However, he did manage to hold on to the New Deal programs already in place. By 1938-1939, his attention turned to the world crisis, as the Second World War loomed. When Roosevelt took office on March 4, 1933, the economy had hit bottom. In the midst of the Great Depression, a quarter of the American workforce was unemployed, two million people were homeless, and industrial production had fallen by more than half since 1929. Roosevelt saw banking reform as the single most urgent task. Thousands of banks had failed or were on the verge of failing, and panicked depositors sought to remove their savings from banks for fear that they would lose their deposits after a bank failure. In the months after Roosevelt's election, several governors declared bank holidays, closing banks so that their deposits could not be withdrawn. By March 4, 1933, gubernatorial proclamations had closed the banks in 32 states; in the remaining states, many banks were closed and depositors were permitted to withdraw only five percent of their deposits. On March 5, Roosevelt declared a federal bank holiday, closing every bank in the nation. His action won widespread praise for Stopping a total collapse of the financial system, and starting the process of reopening the banks and giving people access to their deposits and checking accounts. When the special session of Congress that had been called by Roosevelt opened on March 9, Congress quickly passed Roosevelt's Emergency Banking Act. Rather than nationalizing the financial industry, as some radicals hoped and many conservatives feared, the bill used federal assistance to stabilize privately owned banks. When the banks reopened on Monday, March 13, stock prices rose by 15 percent and bank deposits exceeded withdrawals, thus ending the bank panic. The ensuing "First 100 Days" of the 73rd Congress saw an unprecedented amount of legislation and set a benchmark against which future presidents would be compared. In another measure designed to give Americans confidence in the financial system, Congress enacted the Glass–Steagall Act, which curbed speculation by limiting the investments commercial banks could make and ending affiliations between commercial banks and securities firms. Depositors in open banks received insurance coverage from the new Federal Deposit Insurance Corporation (FDIC), while depositors in permanently closed banks were eventually repaid 85 cents on the dollar. Roosevelt himself was dubious about insuring bank deposits, but public support was overwhelmingly in favor, and the number of bank failures dropped to near zero. The Securities Exchange Act of 1934 established the independent Securities and Exchange Commission to end irresponsible market manipulations and the dissemination of false information about securities. By mandating the disclosure of business information and allowing investors to make informed decisions, the SEC largely succeed in its goal of restoring investor confidence. As part of the first hundred days, Roosevelt fostered the passage of the Securities Act of 1933. The act expanded the powers of the Federal Trade Commission and required companies issuing securities to disclose information regarding the securities they issued. Another major securities law, the Public Utility Holding Company Act of 1935, broke up large public utility holding companies. The law arose from concerns that the holding companies had used elaborate measures to extract profits from subsidiary utility companies while taking advantage of customers. Relief for the unemployed was a major priority for the New Deal, and Roosevelt copied the programs he had initiated as governor of New York. The Federal Emergency Relief Administration (FERA), the largest program from 1933 to 1935, involved giving money to localities to operate work relief projects to employ those on direct relief. FERA was led by Harry Hopkins, who had helmed a similar program under Roosevelt in New York. Another agency, the Public Works Administration (PWA), was created to fund infrastructure projects, and was led by Secretary of the Interior Harold Ickes. Seeking to increase the federal role in providing work relief, Hopkins successfully pushed for the creation of the Civil Works Administration (CWA), which would provide employment for anyone who was unemployed. In less than six months, the CWA hired four million people, and built or repaired 200 swimming pools, 3,700 playgrounds, 40,000 schools, 250,000 miles (400,000 km) of road, and 12 million feet of sewer pipe. [page needed] The CWA was widely popular, but Roosevelt canceled it in March 1934 due to cost concerns and the fear of establishing a precedent that the government would serve as a permanent employer of last resort. The persistent farm crisis of the 1920s was further exacerbated by the onset of the Great Depression, and foreclosures were common among debt-ridden farms. Farmers were locked in a vicious cycle in which low prices encouraged individual farmers to engage in greater production, which in turn lowered prices by providing greater supply. The Hoover administration had created the Federal Farm Board to help address the issue of overproduction by purchasing agricultural surpluses, but it failed to stabilize prices. In the 1930s, Midwestern farmers would additionally have to contend with a series of severe dust storms known as the Dust Bowl, provoking migration from the affected regions. Roosevelt placed a high emphasis on agricultural issues; farmers made up thirty percent of the nation's workforce, and New Dealers hoped that an agricultural recovery would help stimulate the broader economy. The 1933 Agricultural Adjustment Act created the Agricultural Adjustment Administration (AAA). The act reflected the demands of leaders of major farm organizations, especially the Farm Bureau, and reflected debates among Roosevelt's farm advisers such as Wallace, M.L. Wilson, Rexford Tugwell, and George Peek. The aim of the AAA was to raise prices for commodities through a system of "domestic allotments" that created artificial scarcity for agricultural products. The AAA paid land owners subsidies for leaving some of their land idle; funding for the subsidies was provided by a new tax on food processing. The goal was to force up farm prices to the point of "parity," an index based on 1910–1914 prices. To meet these goals, cotton was plowed up, bountiful crops were left to rot, and six million piglets were killed and discarded. Farm incomes increased significantly in the first three years of the New Deal, as prices for commodities rose. However, some sharecroppers suffered under the new system, as some landowners pocketed the federal subsidies distributed for keeping lands fallow. A migrant farm family in California, March 1935. Photo by Dorothea Lange. Many rural people lived in severe poverty, especially in the South. Agencies such as the Resettlement Administration and its successor, the Farm Security Administration (FSA), represented the first national programs to help migrants and marginal farmers, whose plight gained national attention through the 1939 novel and film The Grapes of Wrath. New Deal leaders resisted demands of the poor for loans to buy farms, as many leaders thought that there were already too many farmers. The Farm Credit Administration refinanced many mortgages, reducing the number of displaced farming families. In 1935, the administration created the Rural Electrification Administration (REA), a work-relief program which built electric lines in rural areas. In the decade following the establishment of the REA, the share of farms with electricity went from under 20 percent to approximately 90 percent. Roosevelt appointed John Collier to lead the Bureau of Indian Affairs, and Collier presided over a shift in policy towards Native Americans that de-emphasized cultural assimilation. Native Americans worked in the CCC and other New Deal programs, including the newly formed Soil Conservation Service. In 1933, the administration launched the Tennessee Valley Authority (TVA), a project involving dam construction planning on an unprecedented scale in order to curb flooding, generate electricity, and modernize the very poor farms in the Tennessee Valley region of the Southern United States. [page needed][page needed] Under the leadership of Arthur Ernest Morgan, the TVA built planned communities such as Norris, Tennessee that were designed to serve as models of cooperative, egalitarian living. Though the more ambitious experiments of the TVA generally failed to take hold, by 1940, the TVA had become the largest producer of electric power in the country. The Roosevelt administration also established the Bonneville Power Authority, which performed similar functions to the TVA in the Pacific Northwest, albeit on a smaller scale. The Roosevelt administration launched the National Recovery Administration (NRA) as one of the two major programs designed to restore economic prosperity, along with the AAA. The NRA was established by the National Industrial Recovery Act (NIRA) of 1933, and was designed to implement reforms in the industrial sector. The NRA tried to end cutthroat competition by forcing industries to come up with codes that established the rules of operation for all firms within specific industries, such as minimum prices, minimum wages, agreements not to compete, and production restrictions. Industry leaders negotiated the codes with the approval and guidance of NIRA officials. Other provisions encouraged the formation of unions and suspended anti-trust laws. Roosevelt appointed former General Hugh S. Johnson as the first head of the NRA, and Johnson sought to use the NRA to curb industrial overproduction and keep wages stable. The NRA won the pledges of two million businesses to create and follow NRA codes, and Blue Eagle symbols, which indicated that a company cooperated with the NRA, became ubiquitous. The NRA targeted ten essential industries deemed crucial to an economic recovery, starting with textile industry and next turning to coal, oil, steel, automobiles, and lumber. Though unwilling to dictate the codes to industries, the administration pressured companies to agree to the codes and urged consumers to purchase products from companies in compliance with the codes. As each NRA code was unique to a specific industry, NRA negotiators held a great deal of sway in setting the details of the codes, and many of the codes favored managers over workers. The NRA became increasingly unpopular among the general public due to its micromanagement, and many within the administration began to view it as ineffective. The Supreme Court found the NRA to be unconstitutional by unanimous decision in May 1935. Despite the abolition of the NRA, the New Deal saw the establishment or strengthening of several agencies designed to regulate specific industries. In 1934, Congress established the Federal Communications Commission, which provided regulation to telephones and radio. The Civil Aeronautics Board was established in 1938 to regulate the nascent commercial aviation industry, while in 1935 the authority of the Interstate Commerce Commission was extended to the trucking industry. By 1935, the economy had recovered somewhat from its nadir, but the gross national product was still far below the figure from 1929. With the economy still in depression, and following Democratic triumphs in the 1934 mid-term elections, Roosevelt proposed what became known as the "Second New Deal." In April 1935, Roosevelt won passage of the Emergency Relief Appropriation Act of 1935, which, unlike the work relief programs of 1933, potentially allowed for a permanent role for the government as the employer of last resort. Roosevelt, among others, feared that the private sector would never again be able to provide full employment on its own. The major program created by the Emergency Relief Appropriation Act was the Works Progress Administration (WPA), led by Harry Hopkins. The WPA financed a variety of projects such as hospitals, schools, and roads, and employed more than 8.5 million workers who built 650,000 miles of highways and roads, 125,000 public buildings, as well as bridges, reservoirs, irrigation systems, and other projects. Ickes's PWA continued to function, but the WPA became the primary New Deal work relief program, and FERA was discontinued. [page needed] Though nominally charged only with undertaking construction projects that cost over $25,000, the WPA provided grants for other programs, such as the Federal Writers' Project. The National Youth Administration (NYA), a semi-autonomous unit within the WPA, worked closely with high schools and colleges to set up work-study programs. The United States was the lone modern industrial country where people faced the Depression without any national system of social security, though a handful of states had poorly-funded old-age insurance programs. For most American workers, retirement due to old age was not a realistic option. In the 1930s, physician Francis Townsend galvanized support for his pension proposal, which called for the federal government to issue direct $200-a-month payments to the elderly. Roosevelt was attracted to the general thinking behind Townsend's plan because it would provide for those no longer capable of working while at the same time stimulating demand in the economy and decreasing the supply of labor. 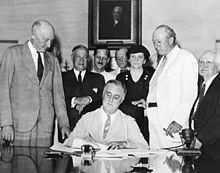 In 1934, Roosevelt charged the Committee on Economic Security, chaired by Secretary of Labor Perkins, with developing an old-age pension program, an unemployment insurance system, and a national health care program. The proposal for a national health care system was dropped, but the committee developed an unemployment insurance program largely administered by the states. The committee also developed an old-age plan that, at Roosevelt's insistence, would be funded by individual contributions from workers. In January 1935, Roosevelt proposed the Social Security Act, which he presented as a more practical alternative to the Townsend Plan. After a series of congressional hearings, the Social Security Act became law in August 1935. During the congressional debate over Social Security, the program was expanded to provide payments to widows and dependents of Social Security recipients. Job categories that were not covered by the act included workers in agricultural labor, domestic service, government employees, and many teachers, nurses, hospital employees, librarians, and social workers. Social Security taxes would be collected from employers by the states, with employers and employees contributing equally to the tax. Because the Social Security tax was regressive, and Social Security benefits were based on how much each individual had paid into the system, the program would not contribute to income redistribution in the way that some reformers, including Perkins, had hoped. In addition to creating the Social Security program, the Social Security Act also established a state-administered unemployment insurance system and the Aid to Dependent Children program, which provided aid to families headed by single mothers. Compared with the social security systems in western European countries, the Social Security Act of 1935 was rather conservative. But for the first time the federal government took responsibility for the economic security of the aged, the temporarily unemployed, dependent children and the handicapped. Reflecting the continuing importance of the Social Security Act, biographer Kenneth S. Davis later called the Social Security Act "the most important single piece of social legislation in all American history." The National Labor Relations Act of 1935, also known as the Wagner Act, guaranteed workers the right to collective bargaining through unions of their own choice. It prohibited unfair labor practices such as discrimination against union members. The act also established the National Labor Relations Board (NLRB) to facilitate wage agreements and to suppress labor disturbances. The Wagner Act did not compel employers to reach agreement with their employees, but, together with the Norris–La Guardia Act of 1932, its passage left labor unions in a favorable legal and political environment. Other factors, including popular works that depicted the struggles of the working class, declining ethnic rivalries, and the La Follette Committee's investigation of anti-labor abuses, further swung the public mood in favor of labor. The result was a tremendous growth of membership in the labor unions, especially in the mass-production sector. When the Flint sit-down strike threatened the production of General Motors, Roosevelt broke with the precedent set by many former presidents and refused to intervene; the strike ultimately led to the unionization of both General Motors and its rivals in the American automobile industry. In the aftermath of the Flint sit-down strike, U.S. Steel granted recognition to the Steel Workers Organizing Committee. The total number of labor union members grew from three million in 1933 to eight million at the end of the 1930s, with the vast majority of union members living outside of the South. Roosevelt argued that the emergency spending programs for relief were temporary, and he rejected the deficit spending proposed by economists such as John Maynard Keynes. He kept his campaign promise to cut the regular federal budget — including a reduction in military spending from $752 million in 1932 to $531 million in 1934. He made a 40% cut in spending on veterans' benefits by removing 500,000 veterans and widows from the pension rolls and reducing benefits for the remainder, as well as cutting the salaries of federal employees and reducing spending on research and education. The veterans were well organized and strongly protested, and most benefits were restored or increased by 1934. Veterans groups such as the American Legion and the Veterans of Foreign Wars won their campaign to transform their benefits from payments due in 1945 to immediate cash when Congress overrode the president's veto and passed the Bonus Act in January 1936. [page needed] The Bonus Act pumped sums equal to 2% of the GDP into the consumer economy and had a major stimulus effect. Government spending increased from 8.0% of gross national product (GNP) under Hoover in 1932 to 10.2% of the GNP in 1936. In mid-1935, Roosevelt began to prioritize a major reform of the tax code. He sought higher taxes on top incomes, a higher estate tax, a graduated corporate tax, and the implementation of a tax on inter-corporate dividends. In response, Congress passed the Revenue Act of 1935, which raised relatively little revenue but did increase taxes on the highest earners. A top tax rate of 79% was set for income above $5 million; in 1935, just one individual, John D. Rockefeller, paid the top tax rate. In early 1936, following the passage of the Bonus Act, Roosevelt again sought to increase taxes on corporate profits. Congress passed a bill that raised less revenue that Roosevelt's proposals, but did impose an undistributed profits tax on corporate earnings. Roosevelt had a lifelong interest in the environment and conservation starting with his youthful interest in forestry on his family estate. Although FDR was never an outdoorsman or sportsman on TR's scale, his growth of the national systems were comparable. FDR created 140 national wildlife refuges (especially for birds) and established 29 national forests and 29 national parks and monuments,[page needed][page needed] including Everglades National Park and Olympic National Park. His favorite agency, the CCC, expended most of its effort on environmental projects. In the dozen years after its creation, the CCC built 13,000 miles of trails, planted two billion trees, and upgraded 125,000 miles of dirt roads. Roosevelt was particularly supportive of water management projects, which could provide hydroelectricity, improve river navigation, and supply water for irrigation. His administration initiated the construction of numerous dams, as well as the All-American Canal and the Central Valley Project. Roosevelt also presided over the establishment of conservation programs and laws such as the Soil Conservation Service, the Great Plains Shelterbelt, and the Taylor Grazing Act of 1934. For the entirety of Roosevelt's first term, the Court consisted of the liberal "Three Musketeers (Supreme Court)," the conservative "Four Horsemen, and the two swing votes in Chief Justice Charles Evans Hughes and Associate Justice Owen Roberts. The court struck down a major New Deal program for the first time through its holding in the 1935 case of A.L.A. Schechter Poultry Corp. v. United States. By the beginning of 1937, the Court had cases on the docket regarding the constitutionality of the Social Security Act and the National Labor Relations Act. After winning re-election, Roosevelt proposed the Judicial Procedures Reform Bill of 1937, which would have allowed him to appoint an additional justice for each incumbent justice over the age of 70; in 1937, there were six Supreme Court Justices over the age of 70. The size of the Court had been set at nine since the passage of the Judiciary Act of 1869, and Congress had altered the number of justices six other times throughout U.S. history. What Roosevelt saw as a necessary and measured reform, many throughout the country saw as an attack on the principal of judicial independence, and critics labeled the Judicial Procedures Reform Bill of 1937 as the "court packing" plan. A bipartisan coalition of liberals and conservatives of both parties opposed the bill, and Chief Justice Hughes broke with precedent by publicly advocating defeat of the bill. Any chance of passing the bill ended with the death of Senate Majority Leader Joseph Taylor Robinson in July 1937, after Roosevelt had expended crucial political capital on the failed bill. Unemployment rate in the U.S. 1910–60, with the years of the Great Depression (1929–39) highlighted; counts people with WPA & CCC jobs as "unemployed." With Roosevelt's influence on the wane following the failure of the Judicial Procedures Reform Bill of 1937, conservative Democrats joined with Republicans to block the implementation of further New Deal regulatory programs. Roosevelt did manage to pass some legislation as long as it had enough Republican support. The Housing Act of 1937 provided for the construction of 270,000 public housing units by 1939, and the second Agricultural Adjustment Act, which re-established the AAA, had bipartisan support from the farm lobby. The Fair Labor Standards Act (FLSA) of 1938, which was the last major piece of New Deal legislation, outlawed child labor, established a federal minimum wage, and required overtime pay for certain employees who worked in excess of forty-hours per week. It had support from some Northern Republicans worried about the competition from low-wage Southern factories. The stock market suffered a major drop in 1937, marking the start of an economic downturn within the Great Depression known as the Recession of 1937–38. Influenced by economists such as Keynes, Marriner Stoddard Eccles, and William Trufant Foster, Roosevelt abandoned his fiscally conservative positions in favor of economic stimulus funding. By increasing government spending, Roosevelt hoped to increase consumption, which in turn would allow private employers to hire more workers and drive down the unemployment rate. In mid-1938, Roosevelt authorized new loans to private industry by the Reconstruction Finance Corporation, and he won congressional approval for over $4 billion in appropriations for the WPA, the FSA, the PWA, and other programs. After the 1938 mid-term elections, the conservative coalition of Republicans and Southern Democrats seized control of Congress, bringing an effective end to the New Deal. Roosevelt's 1939 State of the Union Address was the first such address in which the president did not recommend a major new program. Under the leadership of Chairman Martin Dies Jr., the House Un-American Activities Committee held hearings on alleged Communist influence in government and labor unions. Congress cut appropriations and passed the Hatch Act of 1939, which was designed to prevent federal employees from taking part in political campaigns. In 1936, Roosevelt appointed the Brownlow Committee to recommend changes to the structure of the executive branch. [page needed] The Brownlow Committee warned that the agencies had grown increasingly powerful and independent, and proposed reforms designed to tighten the president's control over these agencies. The committee proposed a plan to consolidate over 100 agencies into 12 departments and allowed the president to appoint several assistants. Congress passed the Reorganization Act of 1939, which was based on the Brownlow Committee's recommendations. Roosevelt then established the Executive Office of the President, which increased the president's control over the executive branch. Roosevelt combined several government public works and welfare agencies into the Federal Works Agency and the Federal Security Agency. He also transferred the powerful Bureau of the Budget from the Treasury Department to the Executive Office of the President. The new law also made possible the 1940 establishment of the Office of Emergency Management, which enabled the immediate creation of numerous wartime agencies. The reorganization is best known for allowing the president to appoint numerous assistants and advisers. Those who built a network of support in Congress became virtually independent "czars" in their specialized domains. Roosevelt's first inaugural address contained just one sentence devoted to foreign policy, indicative of the domestic focus of his first term. The main foreign policy initiative of Roosevelt's first term was what he called the Good Neighbor Policy, which continued the move begun by Coolidge and Hoover toward a more non-interventionist policy in Latin America. American forces were withdrawn from Haiti, and new treaties with Cuba and Panama ended their status as protectorates. In December 1933, Roosevelt signed the Montevideo Convention on the Rights and Duties of States, renouncing the right to intervene unilaterally in the affairs of Latin American countries. Following the withdrawal of U.S. forces from Haiti, the only U.S. military forces remaining in the Caribbean were stationed in the Panama Canal Zone or the Guantanamo Bay Naval Base. Aided by the passage of the Reciprocal Tariff Act and the creation of the Export–Import Bank, trade between the U.S. and Latin America more than tripled between 1931 and 1941. The 1930s marked the high point of American isolationism. The country had a long tradition of non-interventionism, but isolationists in the 1930s sought to keep the U.S. out of world affairs to an unprecedented degree. Isolationist sentiment stemmed from a desire to focus on domestic issues, bitterness over World War I and unpaid debts stemming from that war, and a general detachment from, and reluctance to become involved in, the growing crises in East Asia and Europe. Responding to the country's isolationist mood, Roosevelt dropped his support for U.S. entrance into the League of Nations during the 1932 presidential campaign. Roosevelt was especially reluctant to clash with progressive Republicans senators like George Norris, Robert La Follette, Hiram Johnson, and William Borah, all of whom provided support for his domestic programs and favored an isolationist foreign policy. The isolationist movement was bolstered in the early to mid-1930s by the Nye Committee, which investigated the role of business interests in World War I. In 1931, the Empire of Japan invaded Manchuria and established the puppet state of Manchukuo. The United States and the League of Nations both condemned the invasion, but none of the great powers made any move to evict Japan from the region. In a direct challenge to the Western powers, Japan proclaimed the Amau doctrine, which stated that Japan alone held responsibility for maintaining order in East Asia. In 1933, Adolf Hitler and the Nazi Party came into power in Germany. At first, many in the United States thought of Hitler as a something of a comic figure, but Hitler quickly consolidated his power in Germany and attacked the post-war order established by the Treaty of Versailles. Hitler preached a racist doctrine of Aryan superiority, and his central foreign policy goal was the acquisition of territory to Germany's east, which he sought to repopulate with Germans. Foreign affairs became a more prominent issue by 1935. Italy, under a fascist regime led by Benito Mussolini, invaded Ethiopia, earning international condemnation. In response, Congress passed the first of a series of laws known as the Neutrality Acts. The Neutrality Act of 1935 required Roosevelt to impose an arms embargo on all belligerents in any given foreign war, without any discretion left to the president. Though he privately opposed the Neutrality Act of 1935 and its successors, Roosevelt signed the bills order to preserve his political capital for his domestic agenda. In 1936, Germany and Japan signed the Anti-Comintern Pact, though they never coordinated their strategies. That same year, Germany and Italy allied with one another through the Rome-Berlin Axis agreement. In 1937, Congress passed another Neutrality Act, which, unlike previous such acts, did not include an expiration date for its policies. The act also established a "cash and carry" policy for selling nonmilitary goods to belligerent states, requiring such goods to be purchased in cash and transported by ships from the respective belligerent state. The inability of the League of Nations or the United States to prevent the Italian invasion of Ethiopia emboldened Japan and Germany to pursue their territorial ambitions. After the Marco Polo Bridge Incident, Japan invaded China in July 1937, capturing Chinese capital of Nanjing (or Nanking) before the end of the year. The Nanking Massacre and the USS Panay incident both outraged Americans, but the Neutrality Acts blocked arms sales to China. Roosevelt gained world attention with his October 1937 Quarantine Speech, which called for an international "quarantine" against the "epidemic of world lawlessness." He did not at this point seek sanctions against Japan, but he did begin strategic planning to build long-range submarines that could blockade Japan. In July 1936, civil war broke out in Spain between the left-wing Republican government and right-wing Nationalist rebels lead by General Francisco Franco. Britain and France chose to remain neutral and in solidarity with them, Roosevelt recommended to Congress a nondiscriminatory arms embargo in January 1937, and won near-unanimous approval. Though privately supportive of the Loyalists, Roosevelt feared the Spanish crisis might escalate to a full-scale European war and cooperated with the other democracies to contain the conflict. He also did not want to alienate American Catholics, who were mostly pro-Franco. By spring 1938, as it was clear that Hitler and Mussolini were aiding Franco, Roosevelt was considering a plan to sell American warplanes to the Spanish government, but nothing came of it. As the Nationalists were achieving victory in early 1939, Roosevelt would refer to the embargo as a mistake. In 1936, Germany remilitarized the Rhineland in defiance of the Versailles Treaty. In March 1938, Germany peacefully annexed Austria. Later that year, Germany demanded the annexation of German-speaking parts of Czechoslovakia. In a last desperate effort to keep the peace, Britain and France agreed to German demands with the September 1938 Munich Agreement. Roosevelt supported Britain and France, and insisted on American neutrality in Europe. In March 1939, Hitler flouted the Munich Agreement by occupying the remaining portions of Czechoslovakia. In response, the British announced their commitment to defending Poland, which many assumed Hitler would attack next. After the Munich Agreement, Roosevelt began to prepare for the imminent outbreak of war. He called for the revision of the Neutrality Act in his 1939 State of the Union Address, but his proposal was defeated in both houses of Congress. Roosevelt also ordered an increase in aircraft production, with a concentration on long-range bombers, especially the Boeing B-17 Flying Fortress. World War II began in September 1939 with Germany's invasion of Poland, as France and Britain declared war in response. Western leaders were stunned when the Soviet Union and Germany split control of Poland; the two powers had reached a non-aggression pact in August 1939, which contained a secret protocol for the partition of Poland. Though few Americans wanted to intervene in the war, an October 1939 Gallup poll showed that over 80 percent of the country favored Britain and France over Germany. Per the terms of the Neutrality Act, Roosevelt recognized a state of war in Europe, imposing an arms embargo on France, Britain, and Germany. Days later, Roosevelt called Congress into a special session to revise the Neutrality Act. 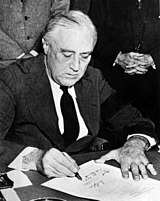 Overcoming the opposition of famous aviator Charles Lindbergh and other isolationists, Roosevelt won passage of the Neutrality Act of 1939, which allowed belligerents to purchase aircraft and other combat material from the United States, albeit only on a cash and carry basis. Though the United States would remain officially neutral until December 1941, Roosevelt continued to seek ways to assist Britain and France. Beginning in September 1939, Roosevelt forged a close personal relationship with Winston Churchill, who became the British prime minister in May 1940. Germany invaded Denmark and Norway in April 1940 and invaded the Low Countries and France in May. 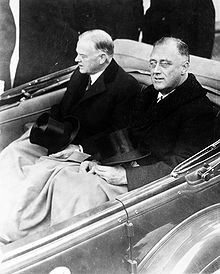 As France's situation grew increasingly desperate, Churchill and French Prime Minister Paul Reynaud appealed to Roosevelt for an American entry into the war, but Roosevelt was still unwilling to challenge the isolationist sentiment in the United States. With France on the verge of defeat, Italy also launched an invasion of France. France surrendered on June 22, resulting in the division of France into a German-controlled zone and a partially occupied area known Vichy France. Roosevelt tried to work with Vichy France from 1940 to 1942 to keep it neutral, with scant success. With the fall of France, Britain and its dominions became the lone major force at war with Germany. Roosevelt, who was determined that Britain not be defeated, took advantage of the rapid shifts of public opinion; the fall of Paris especially led to a decline in isolationist sentiment. Radio coverage of the Battle of Britain, an aerial campaign in which Germany attempted to air superiority and bombed British targets, further galvanized American public opinion behind Britain. Overcoming the opposition of much of the military establishment, who doubted Britain's ability to remain in the war against Germany, Roosevelt pursued policies designed to maximize arms transfers to Britain. In July 1940, Roosevelt appointed two interventionist Republican leaders, Henry L. Stimson and Frank Knox, as Secretaries of War and the Navy, respectively. 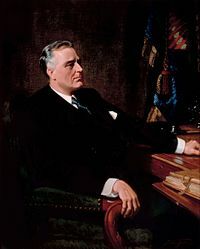 Both parties gave support to his plans for a rapid build-up the American military, but the isolationists warned that Roosevelt would get the nation into an unnecessary war with Germany. On September 2, 1940, Roosevelt defied the spirit of the Neutrality Acts in reaching the Destroyers for Bases Agreement. In exchange for the use of British military bases in the Caribbean Islands, the U.S. transferred 50 old World War I American destroyers, which were to be used to defend against German submarines. The destroyers themselves held relatively little military importance, but the deal represented a symbolic American commitment to Britain. Later in September 1940, with the backing of both major party presidential candidates, Congress authorized the nation's first ever peacetime draft. Hitler and Mussolini responded to the Destroyers for Bases Agreement by joining with Japan in the Tripartite Pact, and the three countries became known as the Axis powers. The Tripartite Act was specifically designed to intimidate the United States into remaining neutral in the Sino-Japanese War and the war in Europe. Roosevelt enjoyed support among the traditional Democratic base of Northern Catholics and Southern whites, but his 1936 re-election depended on mobilizing new voters and retaining the votes of those who had been alienated by Hoover. Roosevelt forged a new coalition consisting of city machines, labor unions, blue collar workers, minorities (racial, ethnic and religious), farmers, white Southerners, people on relief, long-time middle class and business class Democrats, and intellectuals. The New Deal coalition, as it became known, made the Democratic Party the majority party in the 1930s, 1940s, 1950s, and early 1960s. The American political system that incorporated the coalition and its opposition is characterized by scholars as the Fifth Party System. The New Deal coalition had the most dramatic effect in the North, as the Democrats became competitive throughout the region for the first time since the end of the Civil War. Roosevelt also won over working class Protestant voters and progressive Republicans. Many of these progressives continued to vote for Republican congressional candidates, but others joined the Democratic Party. In western states like North Dakota, progressive voters defected en masse to the Democratic Party and became influential in the state party organization. At the same time, many conservative, rural voters returned to the Republican Party after 1932, diminishing the influence of conservative Northern Democrats. Roosevelt appointed African Americans to an unprecedented number of political positions; William H. Hastie became the first African American federal judge. Roosevelt also established an informal "Black Cabinet" to advise him on African-American affairs. Roosevelt supported policies designed to aid the African American community, including the Fair Labor Standards Act, which helped boost wages for non-white workers in the South. In response to Roosevelt's policies, African Americans increasingly defected from the Republican Party during the 1930s and 1940s, becoming an important Democratic voting bloc in several Northern states. However, Roosevelt needed the support of the powerful white Southern Democrats for his New Deal programs, and blacks were still disenfranchised in most of the South. He decided against pushing for legislation that would make lynching a federal crime; such legislation could not pass over a Southern filibuster and the political fight would threaten his ability to pass his priority programs. He did denounce lynchings as "a vile form of collective murder," In 1941, Roosevelt issued Executive Order 8802, which prohibited racial and religious discrimination in employment among defense contractors. He also established the Fair Employment Practices Committee (FEPC) to enforce Executive Order 8802. The FEPC was the first national program directed against employment discrimination, and it played a major role in opening up new employment opportunities to non-white workers. During the war, the number of African Americans employed in the defense industry increased dramatically, as did the number of African Americans employed by the federal government. Roosevelt at first had massive support from the rapidly growing labor unions. Beginning in the mid-to-late 1930s, labor would suffered from a bitter a split that weakened its political power. John L. Lewis, the head of the United Mine Workers (UMW), favored using the UMW's parent organization, the American Federation of Labor (AFL), to organize unskilled workers. After the AFL rejected his proposal, Lewis formed the Congress of Industrial Organizations (CIO) in 1935. Roosevelt pronounced a "plague on both your houses," but labor's disunity weakened the party in the elections from 1938 through 1946. Nonetheless, Roosevelt won large majorities of the union votes, even in 1940 when Lewis took an isolationist position on Europe, as demanded by far-left union elements. The durable connections established during the 1930s helped ensure organized labor's rejection of both socialism and communism, and labor become an important component of the Democratic Party. Though he put together a powerful new political coalition, Roosevelt also alienated various groups. While the First New Deal of 1933 had broad support from most sectors, the Second New Deal challenged the business community. Conservative Democrats, led by Al Smith, fought back with the American Liberty League, savagely attacking Roosevelt and equating him with Karl Marx and Vladimir Lenin. Smith overplayed his hand, and his boisterous rhetoric let Roosevelt isolate his opponents and identify them with the wealthy vested interests that opposed the New Deal, contributing to Roosevelt's 1936 landslide. Early in Roosevelt's term, many Republicans supported New Deal programs, but as progressives left the party or suffered electoral defeat, Republicans became increasingly unified in opposition to Roosevelt. Roosevelt also faced challenges from the left, though the Communist Party was unable to win broad support even in the depths of the Great Depression. A group led by Huey Long, Father Charles Coughlin, and Francis Townsend attempted to launch a political party to challenge Roosevelt from the left, but their effort quickly collapsed. Roosevelt also drew the opposition of some individuals who had been part of the Progressive Movement in the early 20th century, as many of these former progressives distrusted large government programs like the NRA. 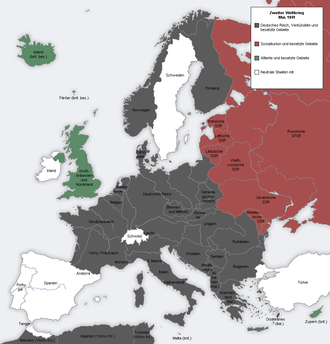 The geopolitical disposition of Europe in 1941. The grey area represents Nazi Germany, its allies, and countries under its firm control. After his victory over Wendell Willkie in the 1940 election, Roosevelt embarked on a public campaign to win congressional support for aid to the British. He stated, "if Great Britain goes down, the Axis Powers will control the continents of Europe, Asia, Africa, Australasia, and the high seas–and they will be in a position to bring enormous military military and naval resources against this hemisphere." In January 1941, Roosevelt asked Congress to approve a Lend-Lease program designed to provide military aid to Britain. With the backing of Willkie, the Lend-Lease bill passed by large majorities in both houses of Congress. Isolationists did, however, prevent the U.S. from providing naval escorts to merchant ships heading to Britain. Roosevelt also requested, and Congress, granted, a major boost in military expenditures. To oversee mobilization efforts, Roosevelt created the Office of Production Management, the Office of Price Administration and Civilian Supply, and the Supply Priorities and Allocation Board. When Nazi Germany invaded the Soviet Union in June 1941, Roosevelt agreed to extend Lend-Lease to the Soviets, committing the United States to a policy of "all aid short of war." In late 1940, Admiral Stark had sent Roosevelt the Plan Dog memo, which set forth a strategic war plan for fighting an anticipated two-front war against Japan and Germany. Stark advocated for a Europe first strategy and the avoidance of conflict with Japan for as long as possible; a key part of this strategy was to ensure that Britain remained in the fight against Germany until the United States, potentially with the aid of other countries, could launch a land offensive into Europe. In an early 1941 conference codenamed "ABC–1," American and British military planners jointly agreed to pursue a Europe first strategy. In August 1941, Roosevelt and Churchill conducted a highly secret bilateral meeting in Argentia, Newfoundland. This meeting produced the Atlantic Charter, which conceptually outlined global wartime and postwar goals. Each leader pledged to support democracy, self-determination, free trade, and principles of non-aggression. Less than a month after Roosevelt and Churchill met at Argentia, a German submarine fired on the U.S. destroyer Greer. In response, Roosevelt announced a new policy in which the U.S. would attack German or Italian ships that entered U.S. naval zones. This "shoot on sight" policy effectively declared naval war on Germany and was favored by Americans by a margin of 2-to-1. Hitler did not aggressively respond to U.S. actions, as he wanted to avoid any incident that would bring the U.S. into the war prior to the defeat of the Soviet Union. In October 1941, the USS Kearny, along with other ships, engaged a number of U-boats south of Iceland; the Kearny took fire and lost eleven crewmen. Following the attack, Congress amended the Neutrality Act to allow U.S. ships to transport material to Britain, effectively repealing the last provision of the cash and carry policy. However, neither the Kearny incident nor an attack on the USS Reuben James changed public opinion as much as Roosevelt hoped they might. By 1940, Japan had conquered much of the Chinese coast and major river valleys, but the Nationalist government of Chiang Kai-shek and Communist forces under Mao Zedong continued to resist the Japanese invasion. Though Japan's government was nominally led by Prime Minister Fumimaro Konoye, Minister of War Hideki Tojo and other military leaders held immense power in the Japanese governmental system. When Japan occupied northern French Indochina in late 1940, Roosevelt authorized increased aid to the Republic of China, a policy that won widespread popular support. He also implemented a partial embargo on Japan, preventing the export of iron and steel. Over the next year, the Roosevelt administration debated imposing an embargo on oil, the key American export to Japan. Though some in the administration wanted to do everything possible to prevent Japanese expansion, Secretary of State Hull feared that cutting off trade would encourage the Japanese to meet its needs for natural resources through the conquest of the Dutch East Indies, British Malaya, British Burma, or the Philippines. With Roosevelt's attention focused on Europe, Hull took the lead in setting Asian policy. Beginning in March 1941, Hull and Japanese ambassador Kichisaburō Nomura sought to reach an accommodation between their respective governments. As the U.S. was not willing to accept the Japanese occupation of China, and Japan was not willing to withdraw from that country, the two sides were unable to reach an agreement. In July, Japan took control of southern French Indochina, which provided a potential staging ground for an attack on British Malaya and the Dutch East Indies. In response, the U.S. cut off the sale of oil to Japan, which thus lost more than 95 percent of its oil supply. Following the American embargo, Japanese leaders turned their attention to the conquest of the Dutch East Indies, which had a large supply of oil. In order to consolidate control of the Dutch East Indies, Japanese military planners believed that they needed to capture the Philippines, take control of the British base at Singapore, and defeat the United States Pacific Fleet, which was stationed at the Hawaiian naval base at Pearl Harbor. No Japanese leader saw the total defeat of the United States as a feasible outcome, but many hoped that a decisive naval victory would convince the Americans to leave control of the Pacific to Japan. Prime Minister Konoye sought a summit with Roosevelt in order to avoid war, but the continued U.S. insistence on the Japanese withdrawal from China scuttled those plans. Tojo succeeded Konoye as prime minister in October, and the Japanese began preparations for an attack on the United States. In November, Nomura made a final offer, asking for reopened trade and acceptance of the Japanese campaign in China in return for Japan's pledge not to attack Southeast Asia. In large part because the U.S. feared that Japan would attack the Soviet Union after conquering China, Roosevelt declined the offer, and negotiations collapsed on November 26. On the morning of December 7, 1941, the Japanese struck the U.S. naval base at Pearl Harbor with a surprise attack, knocking out the main American battleship fleet and killing 2,403 American servicemen and civilians. The great majority of scholars have rejected the conspiracy thesis that Roosevelt, or any other high government officials, knew in advance about the Japanese attack on Pearl Harbor. The Japanese had kept their secrets closely guarded, and while senior American officials were aware that war was imminent, they did not expect an attack on Pearl Harbor. Roosevelt had anticipated that the first attack would take place in the Dutch East Indies, Thailand, or the Philippines. After Pearl Harbor, antiwar sentiment in the United States evaporated overnight. For the first time since the early 19th century, foreign policy became the top priority for the American public. Roosevelt called for war in his famous "Infamy Speech" to Congress, in which he said: "Yesterday, December 7, 1941 — a date which will live in infamy — the United States of America was suddenly and deliberately attacked by naval and air forces of the Empire of Japan." On December 8, Congress voted almost unanimously to declare war against Japan. On December 11, 1941, Germany and Italy declared war on the United States, which responded in kind. Roosevelt portrayed the war as a crusade against the aggressive dictatorships that threatened peace and democracy throughout the world. In late December 1941, Churchill and Roosevelt met at the Arcadia Conference, which established a joint strategy between the U.S. and Britain. Both agreed on a Europe first strategy that would prioritize the defeat of Germany before Japan. With British forces focused on the war in Europe, and with the Soviet Union not at war with Japan, the United States would take the lead in the Pacific War despite its own focus on Germany. The U.S. and Britain established the Combined Chiefs of Staff to coordinate military policy and the Combined Munitions Assignments Board to coordinate the allocation of supplies. An agreement was also reached to establish a centralized command in the Pacific theater called ABDA, named for the American, British, Dutch, and Australian forces in the theater. On January 1, 1942, the United States, Britain, China, the Soviet Union, and twenty-two other countries issued the Declaration by United Nations, in which each nation pledged to defeat the Axis powers. These countries opposed to the Axis would be known as the Allied Powers. Roosevelt coined the term "Four Policemen" to refer the "Big Four" Allied powers of World War II: the United States, the United Kingdom, the Soviet Union and China. Roosevelt, Churchill, Soviet leader Joseph Stalin, and Chinese Generalissimo Chiang Kai-shek cooperated informally on a plan in which American and British troops concentrated in the West; Soviet troops fought on the Eastern front; and Chinese, British and American troops fought in Asia and the Pacific. The Allies formulated strategy in a series of high-profile conferences as well as contact through diplomatic and military channels. Roosevelt had a close relationship with Churchill, but he and his advisers quickly lost respect for Chiang's government, viewing it as hopelessly corrupt. General Joseph Stilwell, who was assigned to lead U.S. forces in the China Burma India Theater, came to believe that Chiang was more concerned with defeating Mao's Communists than with defeating the Japanese. U.S. and Soviet leaders distrusted each other throughout the war, and relations further suffered after 1943 as both sides supported sympathetic governments in liberated territories. By the end of the war, several states, including all of Latin America, had also joined the Allies. The main American role in the war, beyond the military mission itself, was financing the war and providing large quantities of munitions and civilian goods. Lend lease, as passed by Congress in 1941, was a declaration of economic warfare, and that economic warfare continued after the attack on Pearl Harbor. Roosevelt believed that the financing of World War I through loans to the Allies, with the demand for repayment after the war, had been mistake, and he set up the Lend Lease system as a war program, financed through the military budget. One problem that bedeviled the program in 1942 was the strictly limited supply of munitions that had to be divided between Land Lease and American forces. Roosevelt insisted to the military that Russia was to get all the supplies he had promised it. Lend-lease aid to the Soviet Union declined somewhat in mid-1942 after the United States began to prepare for military operations in North Africa. The U.S. spent about $40 billion on Lend Lease aid to the British Empire, the Soviet Union, France, China, and some smaller countries, which amounted to about 11 percent of the cost of the war to the U.S.
A major issue in the economic war was the transportation of supplies. After Germany declared war on the United States, Hitler removed all restrictions on the German submarine fleet. The U.S. Navy faced difficulties in simultaneously protecting Atlantic shipping while also prosecuting the war against Japan, and over one millions tons of Allied shipping was lost in 1942. The cracking of the German Enigma code, along with the construction and deployment of American naval escorts and maritime patrol aircraft helped give the Allied Powers the upper hand in the Battle of the Atlantic after 1942. After the Allies sank dozens of U-boats early 1943, most German submarines were withdrawn from the North Atlantic. The home front was subject to dynamic social changes throughout the war, though domestic issues were no longer Roosevelt's most urgent policy concern. The military buildup spurred economic growth. Unemployment fell in half from 7.7 million in early 1940 to 3.4 million in late 1941, and fell in half again to 1.5 million in late 1942, out of a labor force of 54 million. [b] Though Congress rarely challenged Roosevelt's leadership of the war, major Republican gains in Congress in 1938 and 1942 gave the Conservative Coalition the dominant voice on most domestic issues. 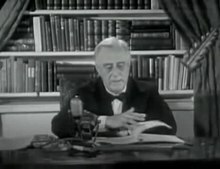 To pay for increased government spending, in 1941 Roosevelt proposed that Congress enact an income tax rate of 99.5% on all income over $100,000; when the proposal failed, he issued an executive order imposing an income tax of 100% on income over $25,000, which Congress rescinded. The Revenue Act of 1942 instituted top tax rates as high as 94% (after accounting for the excess profits tax) and instituted the first federal withholding tax. It also greatly increased the tax base; only four million Americans paid the federal income taxes before the war, while by the end of the war over 40 million Americans paid federal income taxes. In 1944, Roosevelt requested that Congress enact legislation which would tax all "unreasonable" profits, both corporate and individual, and thereby support his declared need for over $10 billion in revenue for the war and other government measures. Congress overrode Roosevelt's veto to pass a smaller revenue bill raising $2 billion. Congress also abolished several New Deal agencies, including the CCC and the WPA. 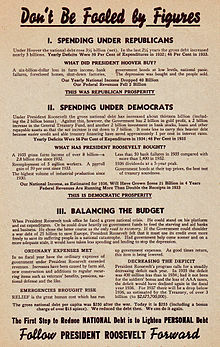 Roosevelt's 1944 State of the Union Address advocated a set of basic economic rights Roosevelt dubbed as the Second Bill of Rights. In the most ambitious domestic proposal of his third term, Roosevelt proposed the G.I. Bill, which would create a massive benefits program for returning soldiers. 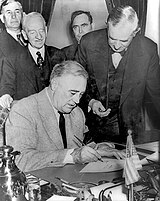 Roosevelt was out-maneuvered by conservatives on bill; he wanted a much narrower bill focused more on poor people, but the American Legion pushed for comprehensive coverage, regardless of income or combat experience, that would avoid the prolonged disputes in the 1920s and 1930s over the aid to veterans. Benefits included tuition and living expense to attend high school or college, a year of unemployment pay at $20 a week, and low-cost loans to buy homes, farms and businesses. The G.I. Bill passed unanimously in both houses of Congress and was signed into law in June 1944. Of the fifteen million Americans who served in World War II, more than half would benefit from the educational opportunities provided for in the G.I. Bill. The U.S. government generally relied on voluntary contracting to mobilize the production of war materials, but in rare cases the Roosevelt administration temporarily took control of industrial facilities. War production increased dramatically after the attack on Pearl Harbor, but that production fell short of the goals established by the president, due in part to manpower shortages. The effort was also hindered by numerous strikes, especially among union workers in the coal mining and railroad industries. Despite various challenges, between 1941 and 1945, the United States produced 2.4 million trucks, 300,000 military aircraft, 88,400 tanks, and 40 billion rounds of ammunition. The production capacity of the United States dwarfed that of other countries; for example, in 1944, the United States produced more military aircraft than the combined production of Germany, Japan, Britain, and the Soviet Union. The United States suffered from inflation during the war, and the administration instituted price and wage controls. In 1943, Roosevelt established the Office of War Mobilization (OWM) to oversee war production. The OWM was led by James F. Byrnes, who came to be known as the "assistant president" due to his influence. As inflation continued to present a major challenge, the administration expanded a rationing program that covered an increasing number of consumer goods. In August 1939, Leo Szilard and Albert Einstein sent the Einstein–Szilárd letter to Roosevelt, warning of the possibility of a German project to develop nuclear weapons. Szilard realized that the recently discovered process of nuclear fission could be used to create a nuclear chain reaction that could be used as a weapon of mass destruction. Roosevelt feared the consequences of allowing Germany to have sole possession of the technology, and authorized preliminary research into nuclear weapons. [c] After the attack on Pearl Harbor, the Roosevelt administration secured the funds needed to continue research and selected General Leslie Groves to oversee the Manhattan Project, which was charged with developing the first nuclear weapons. Roosevelt and Churchill agreed to jointly pursue the project with the Quebec Agreement, and Roosevelt helped ensure that American scientists cooperated with their British counterparts. A typical living quarters of a barrack apartment at the Manzanar internment camp in 1942. Roosevelt had cultivated a friendly relationship with the domestic press throughout his presidency, and his good relations with the press helped ensure favorable coverage of his war-time policies without resorting to heavy-handed censorship. During World War I, the U.S. had passed acts such as the Sedition Act of 1918 to crack down on dissent, but Roosevelt largely avoided such harsh measures. He did order FBI Director J. Edgar Hoover to increase its investigations of dissidents and signed the Smith Act, which made it a crime to advocate the overthrow of the federal government. The attack on Pearl Harbor raised concerns in the public regarding the possibility of sabotage by Japanese Americans. This suspicion was fed by long-standing racism against Japanese immigrants, as well as the findings of the Roberts Commission, which concluded that the attack on Pearl Harbor had been assisted by Japanese spies. The size of the Japanese population in Hawaii precluded mass internment in that territory, but there was strong popular support for the removal of Japanese from the West Coast. In February 1942, President Roosevelt signed Executive Order 9066, which provided for the relocation of hundreds of thousands of Japanese-American citizens and immigrants from the West Coast. They were forced to liquidate their properties and businesses and interned in hastily built camps in interior, harsh locations. Distracted by other issues, Roosevelt had delegated the decision for internment to Secretary of War Stimson, who in turn relied on the judgment of Assistant Secretary of War John J. McCloy. The Supreme Court upheld the constitutionality of the executive order in the 1944 case of Korematsu v. United States. The internment order was rescinded shortly after the Korematsu decision, and Japanese-Americans were allowed to return to the West Coast. Many German and Italian citizens were also arrested or placed into internment camps. The Soviets urged an Anglo-American invasion of German-occupied France as soon as possible in order to divert troops from the Eastern front. Churchill in particular was reluctant to commit troops in Europe in 1942, and strongly favored launching a campaign designed to expel the Axis Powers from North Africa and to consolidate Allied power in the Mediterranean. General Marshall and Admiral King opposed the decision to prioritize North Africa, which they saw as relatively unimportant to the overall war. Roosevelt overrode their objections, as he wanted the U.S. commit ground forces in the European theater, in 1942, and with British cooperation. The Allies invaded French North Africa in November 1942, securing the quick surrender of local Vichy French forces. That surrender was arranged through a deal between General Dwight D. Eisenhower, the supreme commander of the Allied invasion of North Africa, and Vichy Admiral François Darlan. The cooperation with Darlan allowed the Allies to quickly gain control of much of North Africa, but it also alienated Free French leader Charles de Gaulle and other opponents of the Vichy regime. The experience with de Gaulle, Darlan, and another French leader, Henri Giraud, convinced Roosevelt of the necessity to avoid becoming closely associated with any French faction for the remainder of the war. In the Tunisian Campaign, Eisenhower initially faced great difficulties in leading his inexperienced force to success, but Allied forces eventually gained the upper hand. 250,000 Axis soldiers surrendered in May 1943, bringing an end to the war's North African Campaign. At the January 1943 Casablanca Conference, Roosevelt announced that he would only accept the unconditional surrender of Germany, Japan, and Italy. The demand for unconditional surrender was calculated to reassure the Soviets, who were still insisting on an immediate attack on German-occupied France, that the United States would not seek a negotiated peace with Germany. In February 1943, the Soviet Union turned the tide on the eastern front by winning a decisive victory at the Battle of Stalingrad. The Allies launched an invasion of Sicily in July 1943, capturing the island by the end of the following month. During the campaign in Sicily, King Victor Emmanuel III of Italy arrested Mussolini and replaced him with Pietro Badoglio, who secretly negotiated a surrender with the Allies. Despite his earlier insistence on unconditional surrender, Roosevelt accepted armistice terms that allowed Badoglio to remain in power. Germany quickly restored Mussolini to power and set up a puppet state in northern Italy. The Allied invasion of mainland Italy commenced in September 1943, but the Italian Campaign moved slowly until 1945. Roosevelt consented to the campaign only on the condition that the British commit to an invasion of France in mid-1944, and the Allied Powers began to build up a force for that operation, diverting soldiers from the Italian Campaign. To command the invasion of France, Roosevelt passed over Marshall and in favor of General Eisenhower. While building up forces in Britain, the Allied Powers engaged in Operation Bodyguard, an elaborate campaign designed to mask where the Allies would land in Northwestern Europe. Eisenhower launched Operation Overlord, a landing in the Northern French region of Normandy, on June 6, 1944. Supported by 12,000 aircraft that provided complete control of the air, and the largest naval force ever assembled, the Allies successfully established a beachhead in Normandy and then advanced further into France. Though reluctant to back an unelected government, Roosevelt recognized Charles de Gaulle's Provisional Government of the French Republic as the de facto government of France in July 1944. After the Battle of the Falaise Pocket, the Allies pushed Axis forces back towards Germany, capturing Paris in August 1944. Facing logistical issues, Allied forces attempted to secure the Belgian port of Antwerp before moving on Germany's Ruhr region, but the failure of Operation Market Garden delayed the Allied invasion of Germany. In late 1944, Hitler amassed German forces for a major offensive designed to convince the United States and Britain to seek a negotiated peace. A surprise German attack in December 1944 marked the start of the Battle of the Bulge, but the Allies were able to beat back the attack in the following weeks. The Allies advanced across the Rhine River in March 1945 and took control of the Ruhr and the Saarland, key German industrial regions. By April 1945, Nazi resistance was crumbling in the face of advances by both the Western Allies and the Soviet Union. Japan launched an aerial attack on American forces in the Philippines just hours after the attack on Pearl Harbor, and began an invasion of the Philippines later in December 1941. American forces on the Philippines surrendered in May 1942, leaving Japan with approximately ten thousand American prisoners. While it was subduing the Philippines, Japan also conquered Thailand, British Malaya, Singapore, much of Burma, and the Dutch East Indies. After capturing of its initial invasion targets, Japan looked to further expand its territory, taking control of the Solomon Islands and parts of New Guinea. In May 1942, American and Australian forces defeated the Japanese in the Battle of the Coral Sea, prompting a Japanese land campaign across the island of New Guinea. Seeking to seize control of a strategically-placed island and destroy the U.S. fleet in the Pacific, Japan also launched an attack on the American-held Midway Atoll. With the assistance of the Magic cryptanalysis project, Admiral Chester Nimitz led an American force that defeated the Japanese navy at the Battle of Midway, marking a major reversal of fortune in the Pacific War. In August 1942, the United States launched an invasion of the Japanese-held South Pacific island of Guadalcanal in the Solomon Islands; Japanese and American forces contested control of Guadalcanal until February 1943. After the Battle of Guadalcanal, the U.S. adopted an island hopping strategy in order to avoid entrenched Japanese garrisons. By early 1944, Allied forces had established control over much of New Guinea and had landed on the adjacent island of New Britain. While the campaign in the Southwest Pacific continued, U.S. forces launched an offensive in the Central Pacific, beginning with the November 1943 Battle of Tarawa. In June 1944, the U.S. launched an attack on Saipan, in the Mariana Islands, gaining control of the island in early July at the cost of fourteen thousand casualties. As the Battle of Saipan continued, the U.S. won a major naval victory in the Battle of the Philippine Sea, sinking three Japanese aircraft carriers. In July 1944, Roosevelt met with Nimitz and MacArthur, where he authorized the continuation of the campaigns in the Southwest Pacific and the Central Pacific. MacArthur's force would continue its advance towards the Philippines, while the Central Pacific campaign would work its way towards Japan. The U.S. landed on the Philippine island of Leyte in October 1944, provoking a Japanese naval response, as the Philippine Islands maintained a critical position on the Japanese oil supply route from the Dutch East Indies. The Japanese navy was decimated in the resulting Battle of Leyte Gulf, which is sometimes claimed to be the "largest naval battle in history." MacArthur's forces secured control of Leyte in December and had largely re-taken control of the Philippines by March 1945. The U.S. began launching strategic bombing raids on Japan from the Mariana Islands in November 1944, but Japan still controlled several islands surrounding the Japanese archipelago. In February 1945, the U.S. launched an invasion of the well-defended island of Iwo Jima, taking control of that island the following month. On April 1, the U.S. landed on Okinawa Island, the largest of the Ryukyu Islands. Japanese forces on Okinawa held out until June 1945; U.S. forces suffered over 60,000 casualties during the operation. In late 1943, Roosevelt, Churchill, and Stalin agreed to meet to discuss strategy and post-war plans at the Tehran Conference, which marked Roosevelt's first face-to-face meeting with Stalin. At the conference, Britain and the United States committed to opening a second front against Germany in 1944, while Stalin committed to entering the war against Japan at an unspecified date. Roosevelt also privately indicated acceptance of Soviet control of the Baltic states and Soviet plans to shift Poland's borders to the west. Stalin, meanwhile, committed to joining the war against Japan after the defeat of Germany. Post-war plans increasingly came to the fore as the Allies won several major victories in 1944. The wartime economic boom and the experience of the Great Depression convinced many Americans of the need to lower trade barriers. Lend-Lease agreements included provisions for eliminating tariffs, and the U.S. especially desired the dismantlement of the British Imperial Preference system. At the Bretton Woods Conference, the Allies agreed to the creation of the International Monetary Fund, which would provide for currency stabilization, and the World Bank, which would fund post-war rebuilding. Taking up the Wilsonian mantle, Roosevelt also pushed for the establishment of the United Nations, a permanent intergovernmental organization that would succeed the League of Nations. 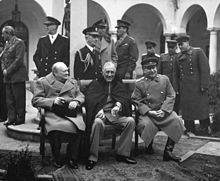 Roosevelt, Churchill, and Stalin met for a second time at the February 1945 Yalta Conference. With the end of the war in Europe approaching, Roosevelt's primary focus was on convincing Stalin to enter the war against Japan; the Joint Chiefs had estimated that an American invasion of Japan would cause as many as one million American casualties. In return for the Soviet Union's entrance into the war against Japan, the Soviet Union was promised ownership of Japanese territories, including Sakhalin Island. With the Soviet Union in control of much of Eastern Europe by early 1945, Roosevelt had little leverage over Soviet actions in Eastern Europe. He did not push for the immediate evacuation of Soviet soldiers from Poland, but he did win the issuance of the Declaration on Liberated Europe, which promised free elections in countries that had been occupied by Germany. Against Soviet pressure, Roosevelt and Churchill refused to consent to imposing huge reparations and deindustrialization on Germany after the war. Roosevelt's role in the Yalta Conference has been controversial; critics charge that he naively trusted the Soviet Union to allow free elections in Eastern Europe, while supporters argue that there was little more that Roosevelt could have done for the Eastern European countries given the Soviet occupation and the need for cooperation with the Soviet Union during and after the war. British, French, and Dutch leaders all hoped to retain or reclaim their colonial possessions after the war. The U.S. was committed to granting independence to the Philippines following the end of the war, and Roosevelt frequently pressured Churchill to similarly commit to the independence of India, Burma, Malaya, and Hong Kong. His motives included principled opposition to colonialism, practical concern for the outcome of the war, and the need to build support for the U.S. in a future independent India. Churchill was deeply committed to imperialism and pushed back hard. Because the U.S. needed British cooperation in India to support China, Roosevelt had to draw back on his anti-colonialism. That annoyed Indian nationalist leaders, though most of those leaders were in British prisons for the duration because they would not support the war against Japan. [page needed] Roosevelt also promised to return Chinese territories seized by Japan since 1895, and ended the practice of American special rights in China. After returning to the United States from the Yalta Conference, Roosevelt addressed Congress on March 1, and many were shocked to see how old, thin and frail he looked. He spoke while seated in the well of the House, an unprecedented concession to his physical incapacity. Still in full command mentally, he firmly stated "The Crimean Conference ought to spell the end of a system of unilateral action, the exclusive alliances, the spheres of influence, the balances of power, and all the other expedients that have been tried for centuries– and have always failed. We propose to substitute for all these, a universal organization in which all peace-loving nations will finally have a chance to join." Roosevelt had been in declining health since at least 1940, and by 1944 he was noticeably fatigued. In March 1944, shortly after his 62nd birthday, he underwent testing and was found to have high blood pressure, atherosclerosis, coronary artery disease causing angina pectoris, and congestive heart failure. Less than a month after his death, on May 8, the war in Europe ended. Harry Truman, who had become president upon Roosevelt's death, dedicated Victory in Europe Day and its celebrations to Roosevelt's memory. Truman kept the flags across the U.S. at half-staff for the remainder of the 30-day mourning period, saying that his only wish was "that Franklin D. Roosevelt had lived to witness this day." As the Japanese remained in the war, Truman considered authorizing an invasion of the Japanese island of Kyushu, but instead ordered the Atomic bombings of Hiroshima and Nagasaki after being informed that the Manhattan Project had successfully developed nuclear weapons. The Japanese surrendered shortly after the atomic bombings, bringing an end to World War II. FDR made one international trip while president-elect and 20 during his presidency. His early travels were by ship, frequently for fishing vacations to the Bahama Banks, Canadian Maritimes or Newfoundland Island. In 1943 he became the first incumbent president to fly by airplane across the Atlantic Ocean during his secret diplomatic mission to Casablanca. Countries visited by Franklin Roosevelt during his presidency. 2 June 29 – July 1, 1933 Canada Campobello Island Vacation. 4 July 5–6, 1934 Haiti Cap Haitien Informal visit en route to vacation in Hawaii. 6 October 16, 1935 Panama Balboa Informal visit with President Harmodio Arias Madrid while returning to Washington, D.C. from the U.S. West Coast. Nassau Fishing trip. Luncheon with Governor Bede Clifford and the President of the Legislative Council, George Johnson. 8 July 28–30, 1936 Canada Campobello Island Vacation. July 31, 1936 Quebec city Official visit. Met with Governor General John Buchan. 9 November 21, 1936 Trinidad and Tobago Port of Spain Stopped on the way to South America. November 27, 1936 Brazil Rio de Janeiro Addressed Brazilian Congress. December 2, 1936 Argentina Buenos Aires Attended session of Inter-American Conference for the Maintenance of Peace. December 3, 1936 Uruguay Montevideo Official visit. Met with President Gabriel Terra. December 11, 1936 Trinidad and Tobago Port of Spain Stopped while returning to the United States. 10 August 4–5, 1938 Panama Balboa Informal visit with President Juan Demóstenes Arosemena during vacation in the Caribbean. 11 August 18, 1938 Canada Kingston Received honorary degree from Queen's University and together with Prime Minister William Lyon Mackenzie King, and the Lieutenant Governor of Ontario, Albert Edward Matthews, dedicated the Thousand Islands Bridge. Balboa Met informally with President Augusto Samuel Boyd during vacation. 14 December 5, 1940 Jamaica Kingston Inspected British base sites for possible American use. December 8, 1940 Saint Lucia Inspected British base sites for possible American use. December 8, 1940 Martinique Fort Saint Louis Conferred with U.S. officials. December 9, 1940 British Leeward Islands Antigua Inspected British base sites for possible American use. December 12–13, 1940 The Bahamas Eleuthera Island Inspected British base sites for possible American use. Met with the Governor, H.R.H. the Duke of Windsor. Returned to the U.S. on December 14. 15 August 9–12, 1941 Newfoundland Argentia Conferred with British Prime Minister Winston Churchill aboard ship (HMS Prince of Wales and USS Augusta) in Placentia Bay. At the conclusion of the conference they issued the Atlantic Charter. 16 January 11, 1943 Trinidad and Tobago Port of Spain Overnight stop en route to Africa. January 14–25, 1943 Morocco Casablanca Attended Casablanca Conference with British Prime Minister Winston Churchill. January 25, 1943 The Gambia Bathurst Overnight stop en route from Casablanca. January 26–27, 1943 Liberia Monrovia Informal visit. Met with President Edwin Barclay. January 28, 1943 Brazil Natal Informal visit. Met with President Getúlio Vargas. January 29, 1943 Trinidad and Tobago Port of Spain Overnight stop en route from Casablanca. 17 April 20, 1943 Mexico Monterrey Part of an exchange of visits with President Manuel Ávila Camacho across the border. Ottawa Attended First Quebec Conference with Prime Minister William Lyon Mackenzie King and British Prime Minister Winston Churchill. Addressed senators, Members of Parliament, and the general public outside the houses of parliament. 19 November 20–21, 1943 Algeria Oran Disembarked. November 21–22, 1943 Tunisia Tunis Overnight stop. November 22–26, 1943 Egypt Cairo Attended First Cairo Conference with British Prime Minister Winston Churchill and Chinese leader Chiang Kai-shek. December 2, 1943 Iran Tehran Attended Tehran Conference with Soviet Premier Joseph Stalin and British Prime Minister Winston Churchill. December 2–7, 1943 Egypt Cairo Attended Second Cairo Conference with British Prime Minister Winston Churchill and Turkish President İsmet İnönü. December 7–9, 1943 Tunisia Tunis Conferred with General Dwight Eisenhower. December 9, 1943 Senegal Dakar Re-embarked for the U.S.
20 September 11–16, 1944 Canada Quebec City Attended Second Quebec Conference with British Prime Minister Winston Churchill and the Allied Combined Chiefs of Staff. 21 February 2, 1945 Malta Floriana Attended Malta Conference with Prime Minister Winston Churchill. February 3–12, 1945 Soviet Union Yalta Attended Yalta Conference with Soviet Premier Joseph Stalin and British Prime Minister Winston Churchill. Alexandria Met with King Farouk, Ethiopian Emperor Haile Selassie, Saudi Arabian King Ibn Saud, and British Prime Minister Winston Churchill. February 18, 1945 Algeria Algiers Briefed U.S. Ambassadors to the United Kingdom, France, and Italy on the Yalta Conference. Although midterm elections normally see the party in control of the presidency lose seats in Congress, the 1934 elections resulted in major Democratic gains in the Senate and minor gains in the House. Roosevelt's New Deal policies were bolstered and several Democrats won in Northern, urban areas outside of the party's traditional base in the South. Among the newly-elected congressmen was Arthur Wergs Mitchell, whose victory in a Chicago-based congressional district made him the first ever African-American Democrat to serve in Congress. After the elections, the Democratic Party controlled over two-thirds of the seats in both the House and the Senate. Roosevelt had feared the possibility of either Huey Long or a progressive Republican entering the race to split the left-wing vote. Roosevelt's Second New Deal, along with the death of Long in September 1935, helped prevent any major third party or Democratic primary challenge. Roosevelt and Garner were unanimously re-nominated at the 1936 Democratic National Convention. The Democratic convention also saw the abolition of the "two-thirds rule," which had required that the Democratic presidential nominee win two-thirds of the delegates rather than a simple majority. With many conservative already alienated by the New Deal, Roosevelt moved to the left and attacked business interests. The Republicans nominated Kansas Governor Alf Landon, who accepted much of the New Deal but objected that it was hostile to business and involved too much waste. Roosevelt and Garner won 60.8% of the vote and carried every state except Maine and Vermont. Roosevelt's victory margin of 515 electoral votes was the largest victory margin since the 1820 presidential election. In the 1936 congressional elections, Democrats expanded their majorities, winning over three-quarters of the seats in both the House and the Senate. Roosevelt had always belonged to the more liberal wing of the Democratic Party, and he sought a realignment that would solidify liberal dominance. During the 1932 campaign he predicted privately, "I'll be in the White House for eight years. When those years are over, there'll be a Progressive party. It may not be Democratic, but it will be Progressive." When a third consecutive Democratic landslide in 1936 failed to produce major legislation in 1937, his recourse was to purge his conservative opponents in 1938. Roosevelt became involved in the 1938 Democratic primaries, actively campaigning for challengers who were more supportive of New Deal reform. His targets denounced Roosevelt for trying to take over the Democratic party and to win reelection, using the argument that they were independent. Roosevelt failed badly, managing to defeat only one target, a conservative Democrat from New York City. In the November 1938 elections, Republicans won thirteen governorships, eight Senate seats, and doubled the number of seats they controlled in the House of Representatives. Democratic losses were concentrated among pro-New Deal, Roosevelt allies like Congressman Maury Maverick of Texas and Governor George Howard Earle III of Pennsylvania. When Congress reconvened in 1939, Republicans under Senator Robert Taft formed a conservative coalition with Southern Democrats, virtually ending Roosevelt's ability to get his domestic proposals enacted into law. Despite their opposition to Roosevelt's domestic policies, many of these conservative Congressmen would provide crucial support for Roosevelt's foreign policy before and during World War II. The two-term tradition had been an unwritten rule (until the ratification the 22nd Amendment after Roosevelt's presidency) since George Washington declined to run for a third term in 1796. Both Ulysses S. Grant and Theodore Roosevelt were attacked for trying to obtain a third non-consecutive term. Roosevelt systematically undercut prominent Democrats who were angling for the nomination, including Vice President John Nance Garner and two cabinet members, Secretary of State Hull and Postmaster General James Farley. Roosevelt moved the convention to Chicago where he had strong support from the city machine, which controlled the auditorium sound system. At the convention the opposition was poorly organized, but Farley had packed the galleries. Roosevelt sent a message saying that he would not run unless he was drafted, and that the delegates were free to vote for anyone. The delegates were stunned; then the loudspeaker screamed "We want Roosevelt... The world wants Roosevelt!" The delegates went wild and he was nominated by 946 to 147 on the first ballot. The tactic employed by Roosevelt was not entirely successful, as his goal had been to be drafted by acclamation. At Roosevelt's request, the convention nominated Secretary of Agriculture Henry Wallace for vice president. Democratic party leaders disliked Wallace, a former Republican who strongly supported the New Deal, but were unable to prevent his nomination. World War II shook up the Republican field, possibly preventing the nomination of isolationist congressional leaders like Taft or Vandenberg. The 1940 Republican National Convention instead nominated Wendell Willkie, the first major party nominee since 1872 who had never held public office. A well-known corporate attorney and executive, Willkie rose to public notice through his criticism of the New Deal and his clashes with the TVA. Unlike his isolationist rivals for the Republican nomination, Willkie favored Britain in the war, and he was backed by internationalist Republicans like Henry Luce. Willkie's internationalist views initially prevented the issue of foreign policy from dominating the campaign, helping to allow for the Destroyers for Bases Agreement and the establishment of a peacetime draft. As the campaign drew to a close, Willkie and other Republicans stepped up their attacks on Roosevelt's foreign policy. Willkie warned that Roosevelt's re-election would lead to the deployment of U.S. troops abroad. In response, Roosevelt stated that "Your boys are not going to be sent into any foreign wars." Roosevelt won the 1940 election with 55% of the popular vote and almost 85% of the electoral vote (449 to 82). Willkie won ten states: strongly Republican states of Vermont and Maine, and eight isolationist states in the Midwest. The Democrats retained their congressional majorities, but the conservative coalition largely controlled domestic legislation and remained "leery of presidential extensions of executive power through social programs." The 1942 midterm election saw sizable Republican gains in both houses of Congress, particularly the House of Representatives. The election bolstered the strength of the conservative coalition. Republicans also won gubernatorial races in several key states, including New York, which elected prosecutor Thomas E. Dewey. Voter turnout was just 33.9%, lower than any subsequent national election (as of 2014). Unlike 1940, Roosevelt openly sought re-election in 1944, and he faced little opposition for the Democratic nomination. He easily won the presidential nomination of the 1944 Democratic National Convention, making him the first person to serve as a major party nominee in four separate presidential elections. Roosevelt favored Henry Wallace or James Byrnes as his running mate in 1944, but Wallace was unpopular among conservatives in the party, while Byrnes was opposed by liberals and many Catholics. At the behest of party leaders, Roosevelt accepted Missouri Senator Harry S. Truman, who was acceptable to all factions of the party. Truman was best known for his battle against corruption and inefficiency in wartime spending as the head of the Truman Committee. Some Republicans asked General Douglas MacArthur to run against Roosevelt, but his campaign quickly collapsed. The 1944 Republican National Convention selected Dewey, the Governor of New York and an internationalist. The opposition lambasted FDR and his administration for domestic corruption, bureaucratic inefficiency, tolerance of Communism, and military blunders. Labor unions threw their all-out support behind Roosevelt. Roosevelt and Truman won the 1944 election by a comfortable margin, defeating Dewey and his running mate John W. Bricker with 53.4% of the popular vote and 432 out of the 531 electoral votes. The rapid expansion of government programs that occurred during Roosevelt's term redefined the role of the government in the United States, and Roosevelt's advocacy of government social programs was instrumental in redefining liberalism for coming generations. Despite these major reforms, the New Deal may have helped to prevent more drastic changes to U.S. society and politics; for example, the United States was one of the few industrial economies to emerge from the 1930s without a major state-owned enterprise. Roosevelt's direct appeals to the public, legislative leadership, and executive reorganization dramatically changed the powers and responsibilities of the president. The New Deal Coalition that he established transformed national politics, contributing to ushering in the Fifth Party System. Through his actions before and during World War II, Roosevelt firmly established a leadership role for the United States on the world stage. His isolationist critics faded away, and even the Republicans joined in his overall policies. Both during and after his terms, critics of Roosevelt questioned not only his policies and positions, but even more so the consolidation of power in the White House at a time when dictators were taking over Europe and Asia. Many of the New Deal programs were abolished during the war by FDR's opponents. The powerful new wartime agencies were set up to be temporary and expire at war's end. The internment of Japanese-Americans is frequently criticized as a major stain on Roosevelt's record. After Roosevelt's death, his widow continued to be a forceful presence in U.S. and world politics, serving as delegate to the conference which established the United Nations and championing civil rights and liberalism generally. Many members of his administration played leading roles in the administrations of Truman, John F. Kennedy and Lyndon B. Johnson, each of whom embraced Roosevelt's political legacy. ^ The 20th Amendment (ratified in 1933) moved Inauguration Day from March 4 to January 20. The 1937 presidential inauguration, Roosevelt's 2nd inauguration, was the first to take place on the new date. ^ Brands 2009, pp. 255–265. ^ Kennedy 1999, pp. 128–129. ^ James MacGregor Burns (1970). The Soldier of Freedom: Roosevelt. Harcourt Brace Jovanovich. pp. 347–48. ^ Brands 2009, pp. 290–295. ^ Dallek 2017, pp. 130–131. ^ Dallek 2017, p. 191. ^ a b Brands 2009, pp. 622–623. ^ David Rigby (2012). Allied Master Strategists: The Combined Chiefs of Staff in World War II. Naval Institute Press. pp. 1925–26. ISBN 9781612513041. ^ Michael Fullilove (2013). Rendezvous with Destiny: How Franklin D. Roosevelt and Five Extraordinary Men Took America into the War a nd into the World. Penguin. pp. 147–49. ISBN 9781101617823. ^ Jeff Shesol, Supreme Power: Franklin Roosevelt vs. the Supreme Court (2011). ^ Clouatre 2012, p. 28. ^ Clouatre 2012, p. 32. ^ Clouatre 2012, p. 34. ^ Sujit Raman, "Felix Frankfurter and his Protégés: Re‐examining the "Happy Hot Dogs"." Journal of Supreme Court History 39#1 (2014): 79-106. ^ Clouatre 2012, p. 36. ^ Clouatre 2012, pp. 39–40. ^ Clouatre 2012, pp. 40–41. ^ Clouatre 2012, p. 45. ^ Renstrom, Peter (2001). The Stone Court: Justices, Rulings, and Legacy. ABC-CLIO. pp. 179–180. ISBN 9781576071533. ^ Ball 2006, p. 9. ^ Urofsky, Melvin (1988). "Conflict among the Brethren". Duke Law Journal. 37 (1): 81–84. ^ Burns 1956, p. 157, 167-68. ^ Roger Biles, A New Deal for the American people (1991) pp 33-56. ^ a b Brands 2009, pp. 286–289. ^ Kennedy 1999, pp. 132–133. ^ Dallek 2017, pp. 139–140. ^ Dallek 2017, pp. 165–166. ^ Christopher W. Shaw, "'The Man in the Street Is for It': The Road to the FDIC." Journal of Policy History 27#1 (2015): pp. 36-60, quote p 47. ^ Mario R. Di Nunzio (2011). Franklin D. Roosevelt and the Third American Revolution. ABC-CLIO. p. 55. ISBN 9780313392832. ^ Kennedy 1999, pp. 367–368. ^ McJimsey 2000, pp. 42–43. ^ McJimsey 2000, pp. 187–188. ^ McJimsey 2000, pp. 97–98. ^ Dallek 2017, p. 156. ^ McJimsey 2000, p. 99. ^ Jean Choate, "FDR and Agriculture" in William D. Pederson, ed. A Companion to Franklin D. Roosevelt (2011) pp 288-90. ^ J. A. Salmond, The Civilian Conservation Corps, 1933–1942; a New Deal Case Study (1967). ^ Kennedy 1999, pp. 199–200. ^ Brands 2009, pp. 405–406. ^ Kennedy 1999, pp. 200–201. ^ Dallek 2017, pp. 146–147. ^ Dallek 2017, pp. 175–176. ^ Dallek 2017, pp. 220–221. ^ Kennedy 1999, p. 252. ^ McJimsey 2000, pp. 89–91. ^ McJimsey 2000, pp. 92–93. ^ Roger Biles, The South and the New Deal (2006). ^ Ronald C. Tobey, Technology as freedom: The New Deal and the electrical modernization of the American home (1996). ^ McJimsey 2000, pp. 87–89. ^ a b Kennedy 1999, p. 379. ^ McJimsey 2000, p. 97. ^ Brands 2009, pp. 374–375. ^ a b Brands 2009, pp. 377–383. ^ Kennedy 1999, pp. 177–179. ^ Dallek 2017, pp. 155–156. ^ McJimsey 2000, pp. 70–71. ^ Dallek 2017, pp. 157–158, 217. ^ Kennedy 1999, pp. 370–374. ^ David E. Kyvig, Repealing national prohibition (2nd ed. 2000). ^ Kennedy 1999, pp. 288–289. ^ Kennedy 1999, pp. 216–217, 247–248. ^ Kennedy 1999, pp. 249–253, 374–375. ^ McJimsey 2000, pp. 102–103. ^ Jason Scott Smith, Building New Deal Liberalism: The Political Economy of Public Works, 1933–1956 (2005). ^ Brands 2009, pp. 420–423. ^ Kennedy 1999, pp. 289–291. ^ Kennedy 1999, pp. 303–307. ^ Kennedy 1999, pp. 314–315. ^ Zelizer, Julian E. (2000). "The Forgotten Legacy of the New Deal: Fiscal Conservatism and the Roosevelt Administration, 1933‐1938". Presidential Studies Quarterly. 30 (2): 332–359. doi:10.1111/j.0360-4918.2000.00115.x. ^ Freidel & 1952–73, pp. 4: 448–52. ^ "Bonus Bill Becomes Law". The New York Times. January 28, 1936. ^ Gary Dean Best, FDR and the Bonus Marchers, 1933–1935 (1992). ^ Kennedy 1999, pp. 275–276. ^ Kennedy 1999, pp. 279–280. ^ Henry L. Henderson and David B. Woolner, eds. FDR and the Environment (2005). ^ Brinkley, Rightful Heritage: Franklin D. Roosevelt and the Land of America (2016), pp. 170-86. ^ McJimsey 2000, pp. 111–116. ^ Kennedy 1999, pp. 326–327. ^ Kennedy 1999, pp. 327–329. ^ Kennedy 1999, pp. 324–325. ^ Kennedy 1999, p. 331. ^ Kennedy 1999, pp. 334–337. ^ William E. Leuchtenburg, The Supreme Court Reborn: The Constitutional Revolution in the Age of Roosevelt (1996). ^ John Mark Hansen (1991). Gaining Access: Congress and the Farm Lobby, 1919–1981. p. 89. ISBN 9780226315560. ^ McJimsey 2000, pp. 174–181. ^ a b Kennedy 1999, p. 349. ^ Kennedy 1999, pp. 363–364. ^ McJimsey 2000, pp. 171–184. ^ Harold C. Relyea, "The Coming of Presidential Czars and their Accountability to Congress: The Initial Years: 1937–1945." White House Studies 11#1 (2011), pp 1-20. ^ Herring 2008, p. 484. ^ Leuchtenburg (1963), pp. 203–10. ^ Beck, Earl R. (1939). "The Good Neighbor Policy, 1933–1938". Historian. 1 (2): 110–131. doi:10.1111/j.1540-6563.1939.tb00468.x. JSTOR 24435879. ^ Kennedy 1999, pp. 391–392. ^ Herring 2008, p. 501. ^ Herring 2008, pp. 502–504. ^ Kennedy 1999, pp. 388–389. ^ Kennedy 1999, p. 390. ^ Kennedy 1999, pp. 387–388. ^ Kennedy 1999, p. 500. ^ Herring 2008, p. 503. ^ a b Burns (1956), p. 261. ^ Kennedy 1999, pp. 383–384. ^ Brands 2009, pp. 479–480. ^ Burns (1956), p. 256. ^ Kennedy 1999, pp. 393–395. ^ Brands 2009, pp. 445–446. ^ Kennedy 1999, p. 385. ^ Kennedy 1999, pp. 400–401. ^ Kennedy 1999, pp. 397–398. ^ Kennedy 1999, pp. 401–403. ^ Herring 2008, pp. 511–512. ^ Dominic Tierney, "Franklin D. Roosevelt and Covert Aid to the Loyalists in the Spanish Civil War, 1936–39." Journal of Contemporary History 39.3 (2004): 299-313. ^ Kennedy 1999, pp. 384–385. ^ Wayne S. Cole, "Roosevelt and Munich." Diplomatic History 23.1 (1999): 107-110. ^ Kennedy 1999, pp. 421–422. ^ Kennedy 1999, pp. 419–423. ^ Jeffery S. Underwood, The Wings of Democracy: The Influence of Air Power on the Roosevelt Administration, 1933–1941 (1991). ^ Herring 2008, pp. 517–518. ^ Kennedy 1999, pp. 426–427. ^ Kennedy 1999, pp. 432–434. ^ Black 2005, pp. 503–6. ^ Kennedy 1999, pp. 442–443. ^ Brands 2009, pp. 548–552. ^ Kennedy 1999, pp. 439–440. ^ Zahniser, Marvin R. (1987). "The French Connection: Thirty Years of French-American Relations". Reviews in American History. 15 (3): 486–492. doi:10.2307/2702049. JSTOR 2702049. ^ Leuchtenberg 1963, pp. 399–402. ^ Herring 2008, p. 523. ^ Kennedy 1999, pp. 446–450. ^ Burns (1956), p. 420. ^ Richard M. Pious, "The Historical Presidency: Franklin D. Roosevelt and the Destroyer Deal: Normalizing Prerogative Power." Presidential Studies Quarterly 42#1 (2012): 190-204. ^ Kennedy 1999, pp. 453–454. ^ a b Kennedy 1999, pp. 459–460. ^ Burns 1956, pp. 437-52. ^ Kennedy 1999, pp. 505–506. ^ McJimsey 2000, pp. 139–140. ^ John M. Allswang, New Deal and American Politics (1978) and Kristi Andersen, The Creation of a Democratic Majority, 1928–1936 (1979), and Everett Carll Ladd Jr., Transformations of the American Party System: Political Coalitions from the New Deal to the 1970s (2nd ed. 1978) are based on voting statistics and polls. ^ McJimsey 2000, pp. 140–141. ^ McJimsey 2000, pp. 141–142. ^ Kennedy 1999, p. 378. ^ McJimsey 2000, pp. 162–163. ^ Dubay, Robert W. (1968). "Mississippi and the Proposed Federal Anti-Lynching Bills of 1937–1938". Southern Quarterly. 7 (1): 73–89. ^ Harvard Sitkoff (2010). Toward Freedom Land: The Long Struggle for Racial Equality in America. University Press of Kentucky. p. 37. ISBN 978-0813139753. ^ Kennedy 1999, p. 775. ^ Kennedy 1999, pp. 296–297. ^ a b Kennedy 1999, pp. 301–302. ^ Irving Bernstein,The turbulent years: A history of the American worker, 1933–1941 (1969) pp 719-20. ^ Ross, Hugh (1976). "John L. Lewis and the Election of 1940". Labor History. 17 (2): 160–189. doi:10.1080/00236567608584379. ^ Kennedy 1999, pp. 322–323. ^ McJimsey 2000, p. 145. ^ Kennedy 1999, pp. 223–224. ^ McJimsey 2000, pp. 136–139. ^ McJimsey 2000, p. 135. ^ Herring 2008, pp. 524–525. ^ Kennedy 1999, pp. 401–402. ^ Kennedy 1999, pp. 469–470. ^ Kennedy 1999, pp. 473–474. ^ Kennedy 1999, pp. 476–478. ^ Kennedy 1999, pp. 479–480. ^ Kennedy 1999, p. 496. ^ Kennedy 1999, pp. 497–498. ^ Kennedy 1999, pp. 492, 498–499. ^ Burns 1970, p. 148. ^ Kennedy 1999, pp. 499–500. ^ Brands 2009, pp. 615–616. ^ Kennedy 1999, pp. 502–504, 673. ^ a b Burns 1970, pp. 134–46. ^ a b Kennedy 1999, pp. 505–507. ^ Kennedy 1999, pp. 507–508. ^ Kennedy 1999, pp. 512–515. ^ Kennedy 1999, pp. 520–522. ^ Smith 2007, pp. 523–39. ^ Herring 2008, p. 538. ^ Brands 2009, pp. 632–633. ^ Brands 2009, pp. 633–635. ^ a b Smith 2007, pp. 545–547. ^ Kennedy 1999, pp. 809–810. ^ Herring 2008, pp. 547, 574–578. ^ Kennedy 1999, pp. 671–673. ^ Herring 2008, pp. 546–547, 582–586. ^ Herring 2008, pp. 555–557. ^ Warren F. Kimball, Forged War: Roosevelt, Churchill and the Second World War (1997), p 74. ^ William Hardy McNeil, America, Britain and Russia: Their cooperation and conflict 1941-1946 (1953) pp 118-50, 772-86. ^ Maurice Matlof and Edwin M. Snell, Strategic Planning for Coalition Warfare 1941-1942 (1953) pp 205-10. ^ Kennedy 1999, pp. 575, 579–580. ^ Kennedy 1999, pp. 565–569. ^ Kennedy 1999, pp. 569–571. ^ Kennedy 1999, pp. 589–590. ^ Young, Congressional Politics (1956), pp 220-23. ^ James T. Patterson, Mr. Republican: A Biography of Robert A. Taft (1972), pp 251-67, 285-98. ^ Kennedy 1999, p. 624. ^ McJimsey 2000, p. 249. ^ Glenn C. Altschuler and Stuart M. Blumin, The GI Bill: A New Deal for Veterans (2009) pp 54-57. ^ Kennedy 1999, pp. 619–623. ^ McJimsey 2000, pp. 242–243. ^ a b c Smith 2007, p. 575–576. ^ McJimsey 2000, pp. 245–246. ^ Smith 2007, p. 578–581. ^ Brands 2009, pp. 653–656. ^ a b Smith 2007, pp. 549–553. ^ Kennedy 1999, pp. 748–750. ^ Kennedy 1999, pp. 753–754. ^ Kennedy 1999, p. 759. ^ Kennedy 1999, pp. 576–577. ^ Kennedy 1999, pp. 577–579. ^ Kennedy 1999, pp. 581–583. ^ Kennedy 1999, pp. 583–584. ^ Kennedy 1999, pp. 587–588. ^ a b Kennedy 1999, pp. 594–598. ^ Kennedy 1999, pp. 693–695. ^ Smith 2007, pp. 598–599. ^ Kennedy 1999, pp. 730–732. ^ Kennedy 1999, pp. 734–737. ^ Kennedy 1999, pp. 739–742. ^ Kennedy 1999, pp. 734, 745. ^ Kennedy 1999, pp. 526–531. ^ a b Kennedy 1999, pp. 531–532. ^ Kennedy 1999, pp. 532–534, 536. ^ Kennedy 1999, pp. 537–543. ^ Kennedy 1999, pp. 547, 553–560. ^ Kennedy 1999, pp. 562–564. ^ Kennedy 1999, pp. 609–610. ^ Kennedy 1999, pp. 816–818. ^ Kennedy 1999, pp. 819–820. ^ Kennedy 1999, p. 821. ^ Kennedy 1999, pp. 822–829. ^ Kennedy 1999, pp. 829–831. ^ Kennedy 1999, pp. 831–834. ^ Kennedy 1999, pp. 677–679, 685. ^ Kennedy 1999, pp. 681–682. ^ a b c Smith 2007, pp. 623–624. ^ Kennedy 1999, pp. 801–802. ^ DeParle, Jason (November 26, 1989). "THE WORLD; The Bitter Legacy of Yalta: Four Decades of What-Ifs". New York Times. Retrieved October 14, 2017. ^ Kennedy 1999, p. 807. ^ Kennedy 1999, p. 806. ^ George T. Mazuzan. Warren R. Austin at the U. N., 1946-1953 (Kent State UP, 1977). ^ Kennedy 1999, p. 670. ^ Herring 2008, pp. 569–578. ^ "President Roosevelt's Report To Congress On the Crimea Conference". The New York Times. Retrieved March 2, 2008. ^ Lerner, Barron H. (April 12, 1945). "How Much Confidence Should We Have in the Doctor's Account of FDR's Death?". George Mason University. Retrieved February 7, 2010. ^ Jones, Jeffrey M.; Jones, Joni L PhD, RN. "Presidential Stroke: United States Presidents and Cerebrovascular Disease (Franklin D. Roosevelt)". Journal CMEs. CNS Spectrums (The International Journal of Neuropsychiatric Medicine). Retrieved July 20, 2011. ^ "Person of the Century Runner-Up: Franklin Delano Roosevelt". Time. March 1, 2000. Archived from the original on June 1, 2000. Retrieved October 9, 2008. ^ McCullough 1992, pp. 345, 381. ^ Kennedy 1999, pp. 834–835, 838–841. ^ Kennedy 1999, pp. 850–851. ^ "Travels of President Franklin D. Roosevelt". U.S. Department of State Office of the Historian. ^ a b Cross, Robert (2003). Sailor in the Whitehouse: The Seafaring Life of FDR. Naval Institute Press. ISBN 9781612515007. Retrieved February 26, 2016. ^ Dropkin, Les (March 2001). "Cruising With The President: An Annotated Chronology of Franklin D.Roosevelt's Cruises During the Potomac Years" (PDF). usspotomac.org. The Potomac Association. pp. 4–5. Retrieved February 26, 2016. ^ Gratwick, Harry (2009). Penobscot Bay: People, Ports & Pastimes. The History Press. p. 72. ISBN 9781596296237. ^ Parliament of Canada. "Heads of States and of Governments who have addressed Joint Sessions of the Senate and House of Commons of Canada". Queen's Printer for Canada. Retrieved May 4, 2015. ^ a b Busch, Andrew (1999). Horses in Midstream. University of Pittsburgh Press. pp. 138–145. ^ Kennedy 1999, pp. 216–217. ^ Kennedy 1999, p. 243. ^ Kennedy 1999, pp. 277–278. ^ Schulman, Bruce (1994). From Cotton Belt to Sunbelt: Federal Policy, Economic Development, and the Transformation of the South, 1938–1980. Duke University Press. pp. 44–46. ISBN 978-0822315377. Retrieved October 8, 2015. ^ Kennedy 1999, pp. 282–283. ^ Burns (1956), p. 284. ^ Kennedy 1999, p. 286. ^ Brands 2009, pp. 272, 498. ^ Leuchtenburg (1963), pp. 239–43. ^ Leuchtenburg (1963), pp. 262–3, 271–3. ^ Caro, Robert A. (1982). The Path to Power. The Years of Lyndon Johnson. New York: Alfred A Knopf. pp. 578–81. ISBN 978-0-394-49973-4. ^ Burns 1956, p. 428. ^ Kennedy 1999, pp. 457–458. ^ Kennedy 1999, pp. 455–456. ^ Kennedy 1999, pp. 462–463. ^ Kennedy 1999, pp. 463–464. ^ Busch, Andrew (1999). Horses in Midstream. University of Pittsburgh Press. p. 157. ^ Kennedy 1999, pp. 782, 789. ^ Charlotte Alter. "Voter Turnout in Midterm Elections Hits 72-Year Low". Time. Retrieved November 11, 2014. ^ Charlotte Alter (November 10, 2014). "2014 midterm election turnout lowest in 70 years". PBS. Retrieved November 11, 2014. ^ a b Kennedy 1999, pp. 788–789. ^ Kennedy 1999, pp. 788–791. ^ Kennedy 1999, p. 364. ^ a b Leuchtenburg, William E. (October 4, 2016). "FRANKLIN D. ROOSEVELT: IMPACT AND LEGACY". Miller Center. University of Virginia. Retrieved May 16, 2018. ^ Black, Franklin Delano Roosevelt: Champion of Freedom (2005) p. 272. ^ Guo, Jeff (November 18, 2015). "Before people start invoking Japanese American internment, they should remember what it was like". Washington Post. Retrieved August 30, 2016. ^ "Historian Survey Results Category: Performance Within Context of Times". C-SPAN Survey of Presidential Leadership. C-SPAN. Retrieved May 4, 2015. ^ Leuchtenburg, William E (1997). "Chapter One: Franklin D. Roosevelt: The First Modern President". The FDR Years: On Roosevelt and His Legacy. Columbia University Press. Burns, James MacGregor (1956). Roosevelt: The Lion and the Fox. scholarly biography to 1940; online. Clouatre, Douglas (2012). Presidents and their Justices. University Press of America. ISBN 9780761853749. Dallek, Robert (2017). Franklin D. Roosevelt: A Political Life. Viking. ISBN 9780698181724. Larrabee, Eric (1987), Commander in Chief: Franklin Delano Roosevelt, His Lieutenants, and Their War, ISBN 978-0-06-039050-1 . Detailed history of how FDR handled the war. Leuchtenburg, William (2015). The American President: From Teddy Roosevelt to Bill Clinton. Oxford University Press. Goodwin, Doris Kearns (1994). No Ordinary Time: Franklin & Eleanor Roosevelt: The Home Front in World War II. Simon and Schuster. ISBN 9781476750576. Badger, Anthony. The New Deal: The Depression Years, 1933–1940 (2002). Biles, Roger. A New Deal for the American People (Northern Illinois UP, 1991). Brinkley, Douglas G. Rightful Heritage: Franklin D. Roosevelt and the Land of America (2016) excerpt; On FDR's environmental and conservation beliefs & policies. Andrew, Christopher. For the President’s Eyes Only: Secret Intelligence and the American Presidency from Washington to Bush (1995), pp 75-148. Barron, Gloria J. Leadership in Crisis: FDR and the Path to Intervention (1973). Tierney, Dominic. FDR and the Spanish Civil War: Neutrality and Commitment in the Struggle That Divided America (Duke University Press, 2007). Doenecke, Justus D; Stoler, Mark A (2005), Debating Franklin D. Roosevelt's Foreign Policies, 1933–1945, Lanham: Rowman & Littlefield, ISBN 978-0847694150 . 248 pp. ——— (1946), Zevin, BD (ed. ), Nothing to Fear: The Selected Addresses of Franklin Delano Roosevelt, 1932–1945 (selected speeches) . ——— (2005) , Taylor, Myron C (ed. ), Wartime Correspondence Between President Roosevelt and Pope Pius XII (reprint), Prefaces by Pius XII and Harry Truman, Kessinger Publishing, ISBN 978-1-4191-6654-9 .